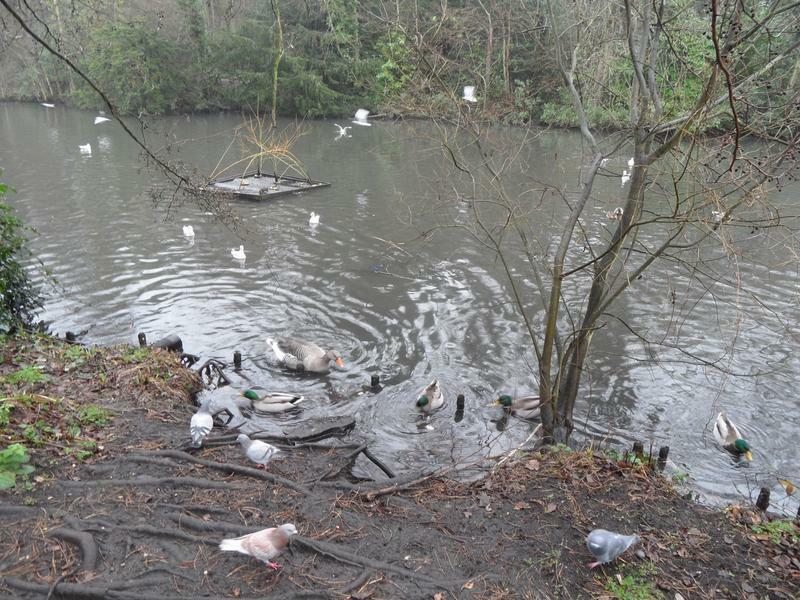 4th January 2015, the park is quiet today, not many people feeding the water fowl. 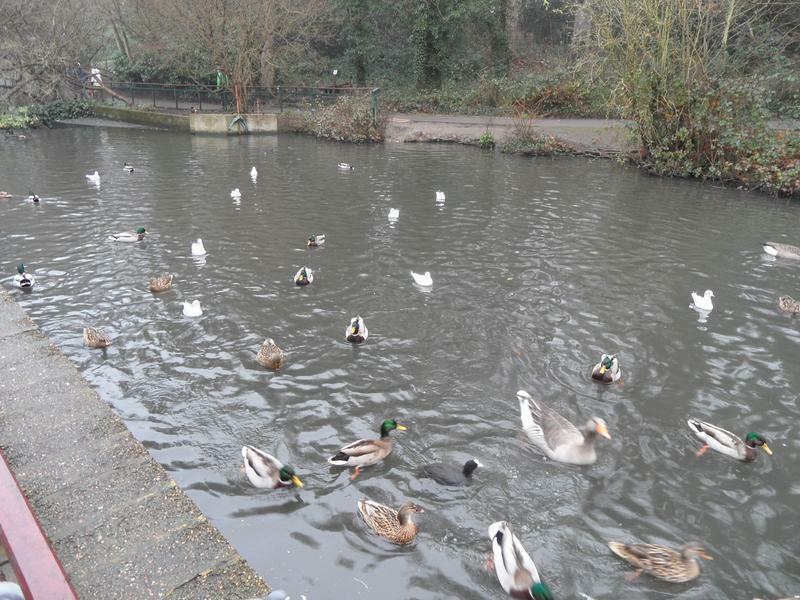 Note sure if these are White Mallards or Call Ducks. 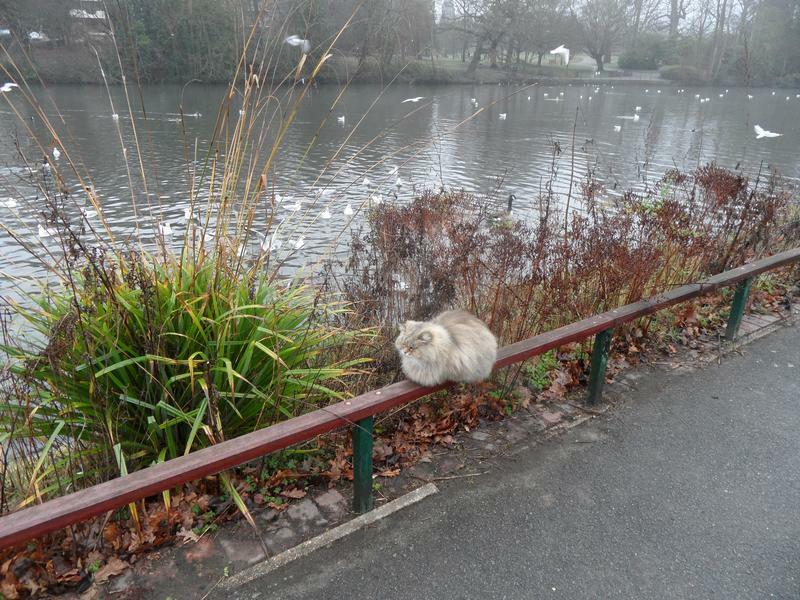 Saw two cats in the park today, this one is watching the geese. 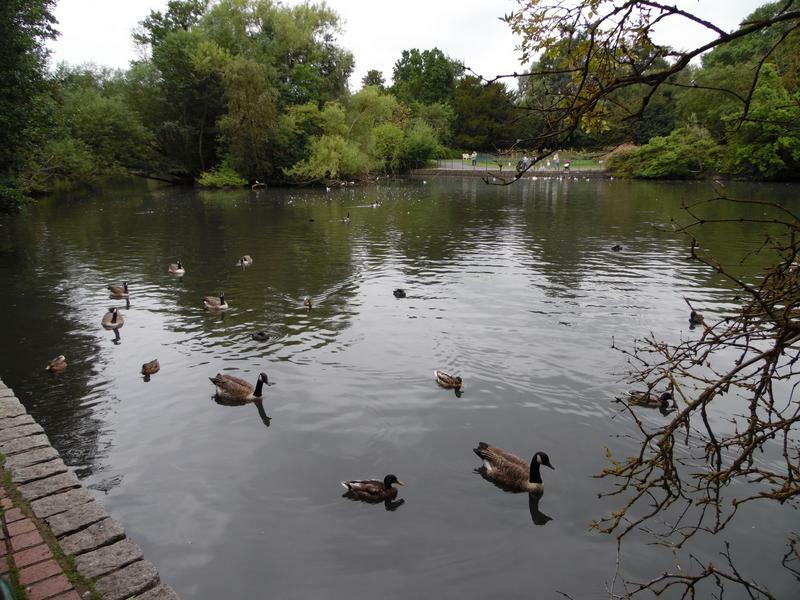 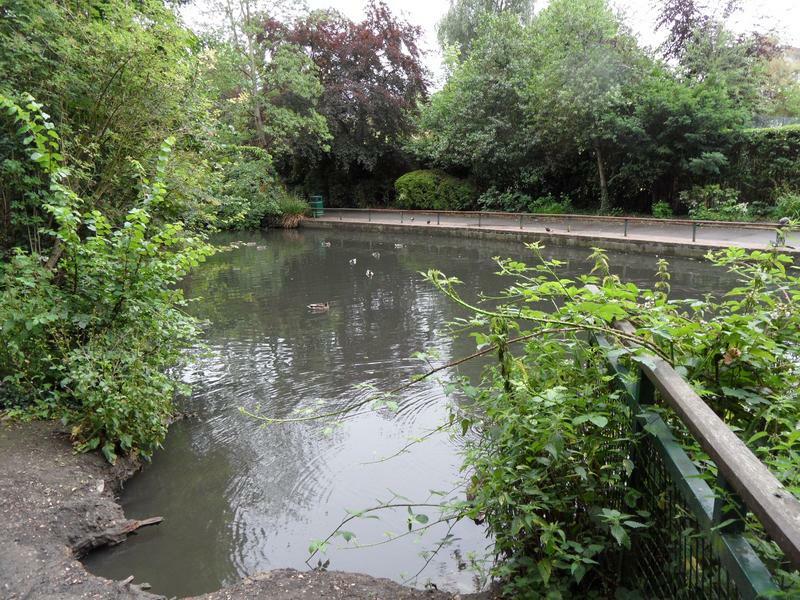 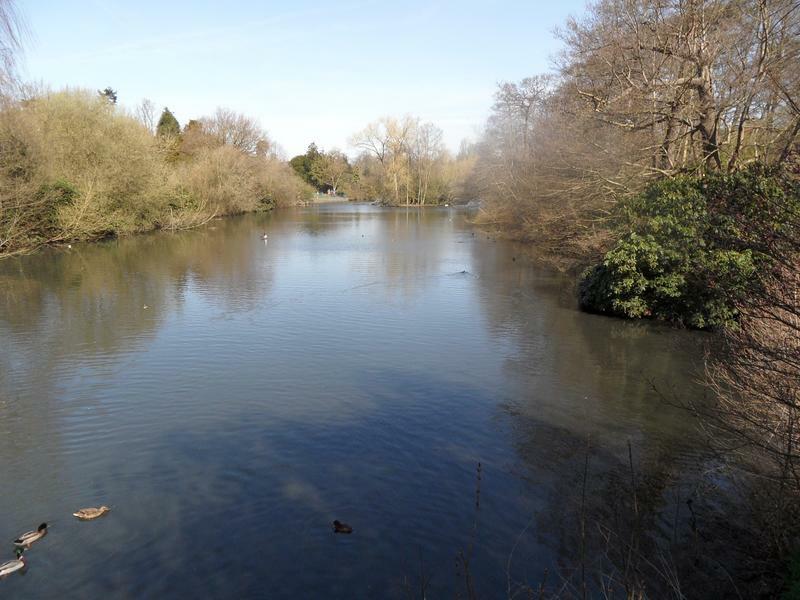 The upper lake is quiet, apart from numerous pigeons and gulls. 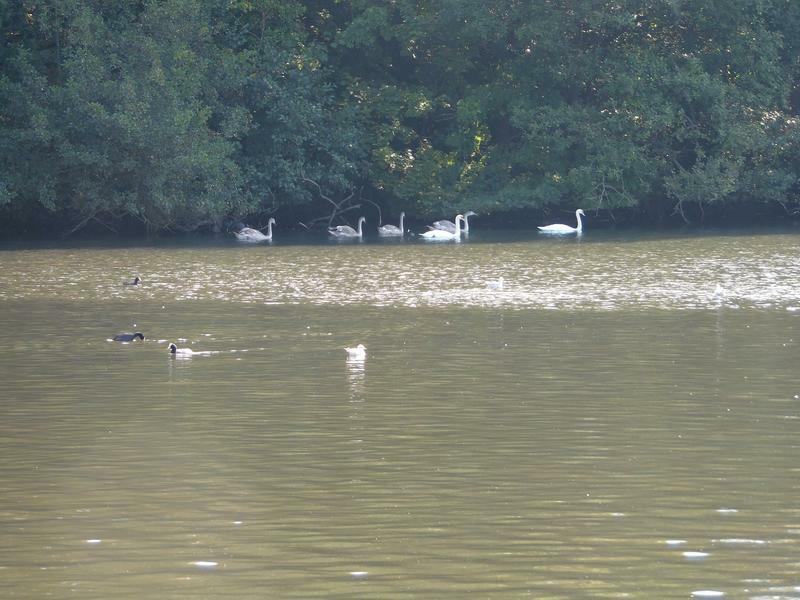 Many more gulls on the main lake, with some Tufted Ducks. 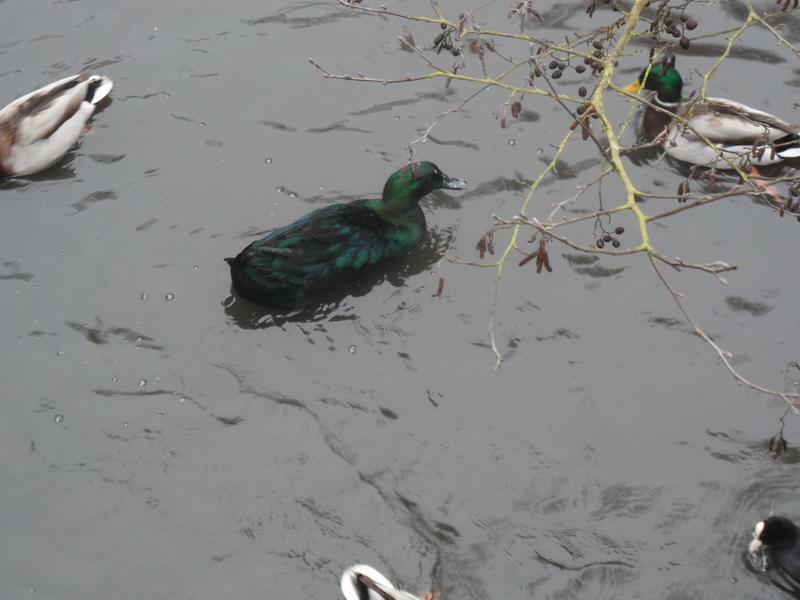 A very strange looking duck on the lower pond, a totally green Mallard, probably caused by the same genes as White Mallards. 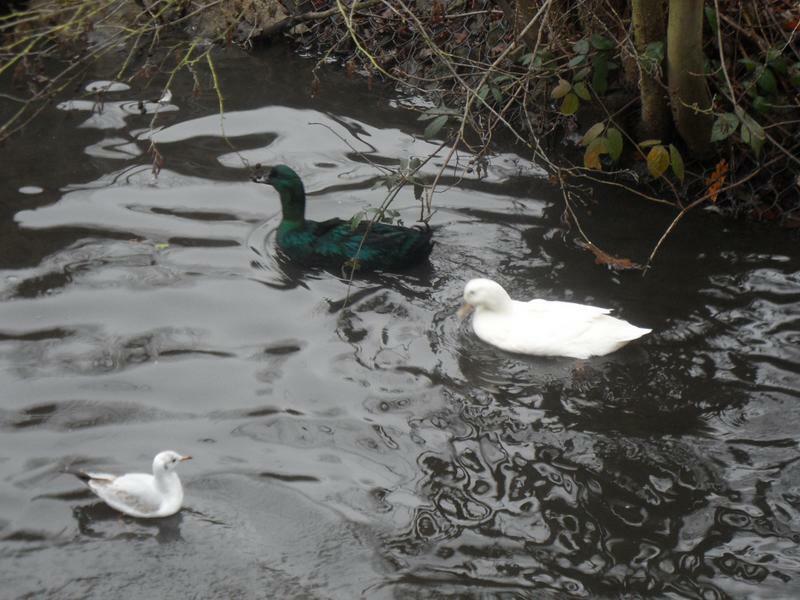 The green Mallard again with a White Mallard. 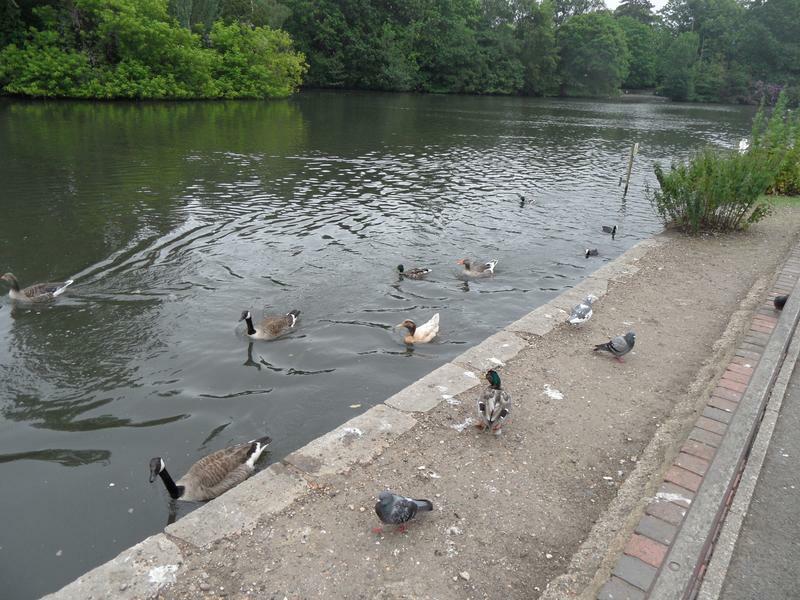 Another view of the main lake, a Coot, several Tufted Ducks and Canada Geese. 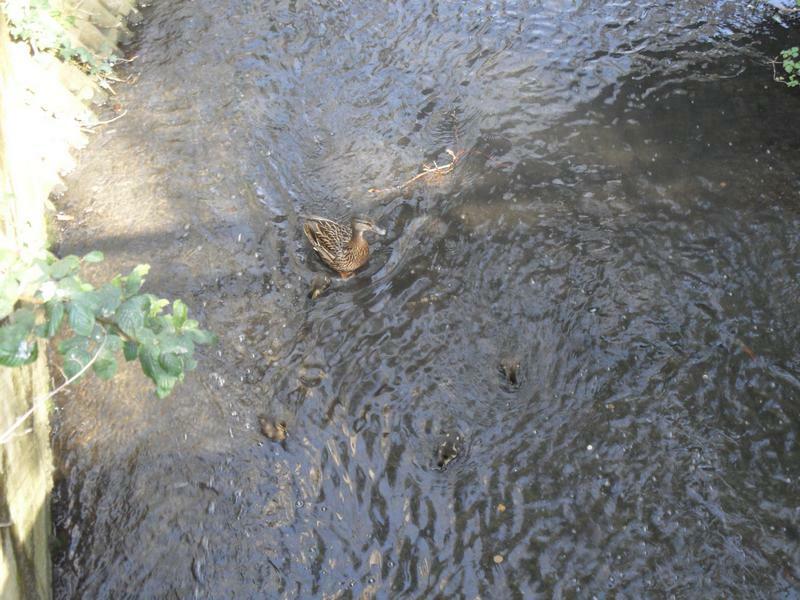 12th April 2015, first Mallard ducklings of the year, on the stream under the bridge at the top of the park, reasonably safe from predators here. 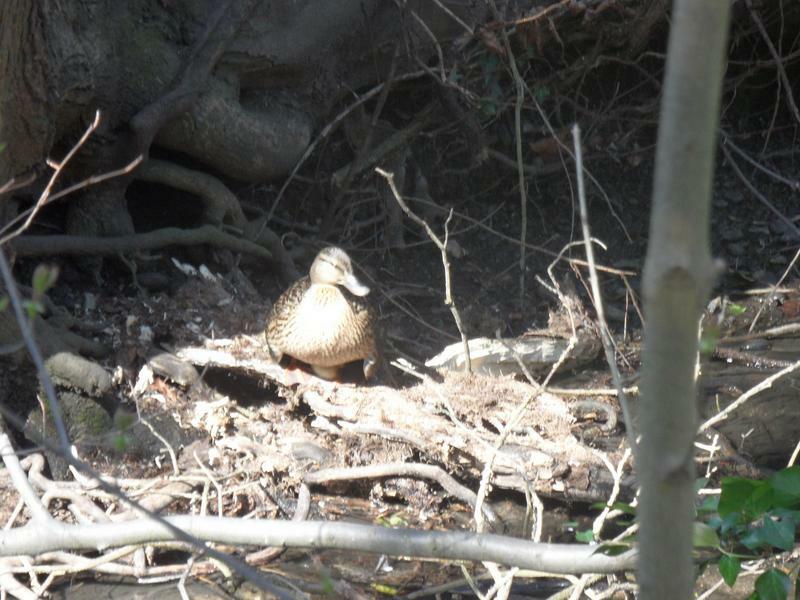 A little later, the same mother is sitting on her sleeping ducklings on the stream bank. 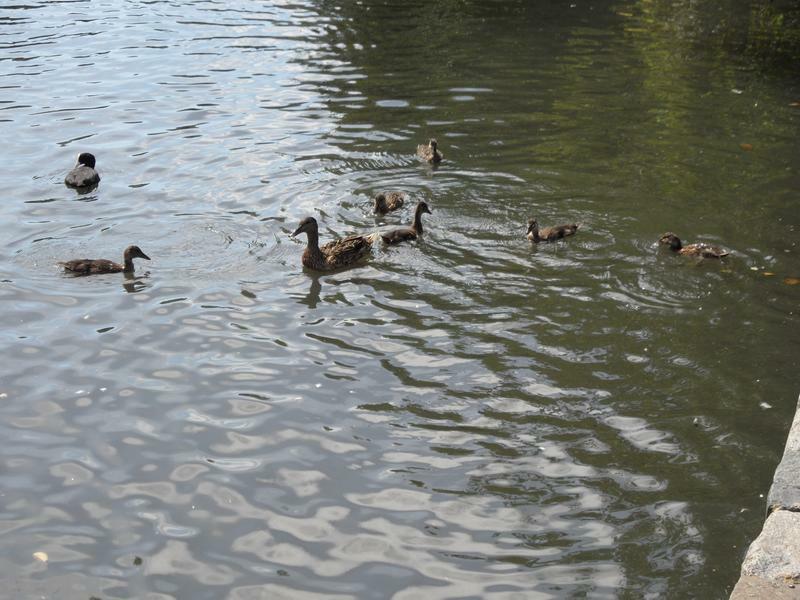 A second Mallard family on the top pond. 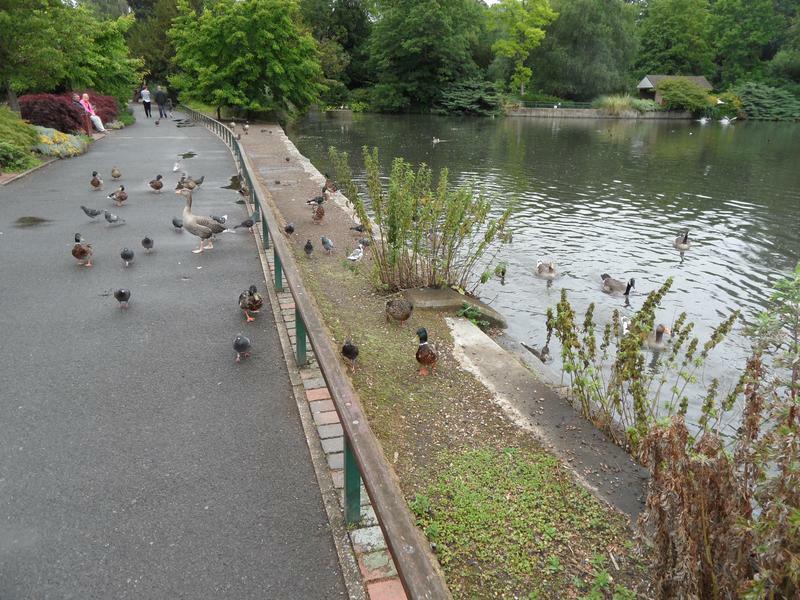 Not much happening on this lake. 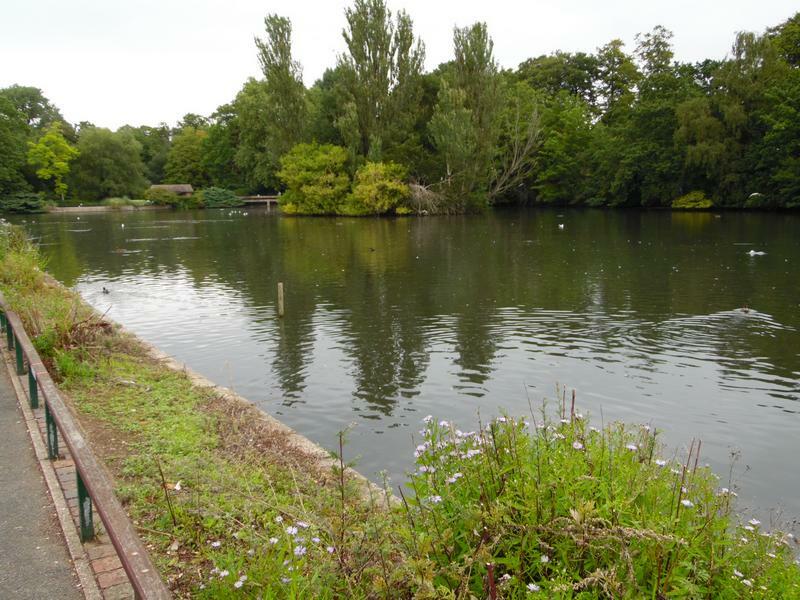 Nor on the main lake. 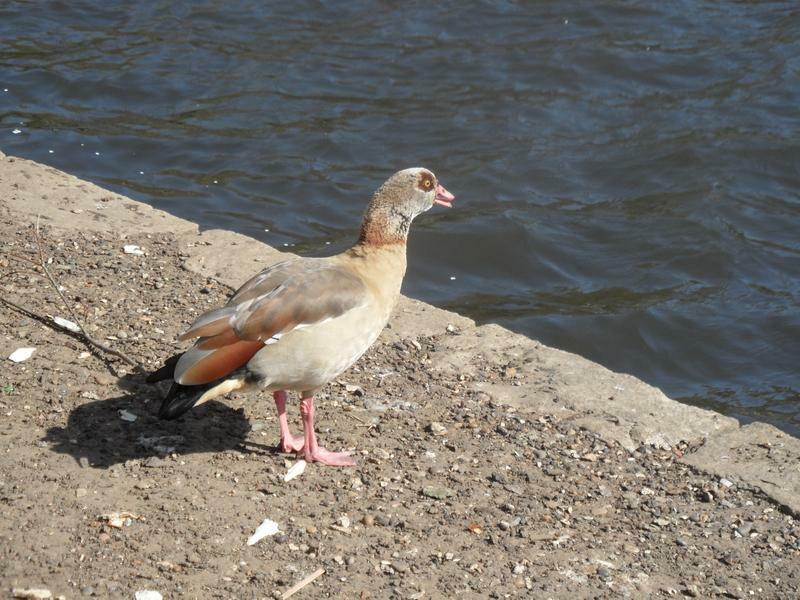 An Egyptian Goose just off the path by the main lake, previously only seen them on a small pond at the bottom of the park. 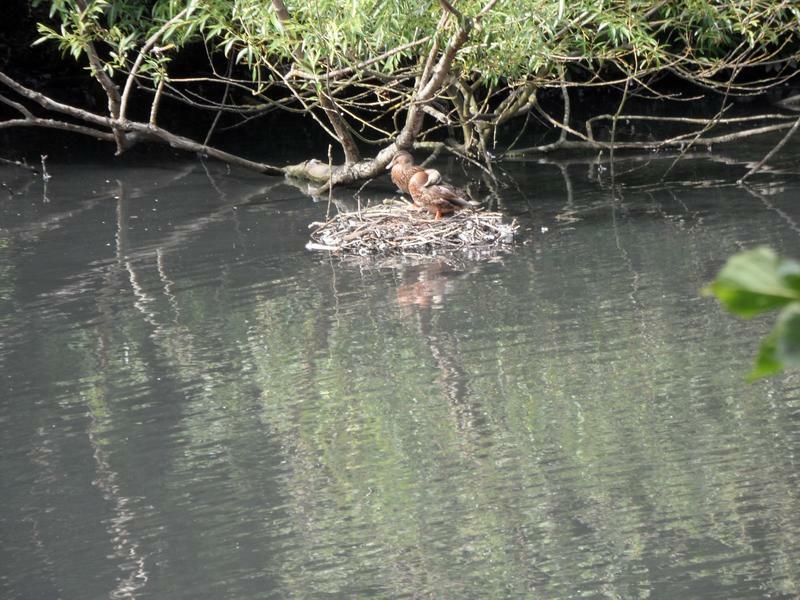 A Moorhen sitting on the nest just off the main path. 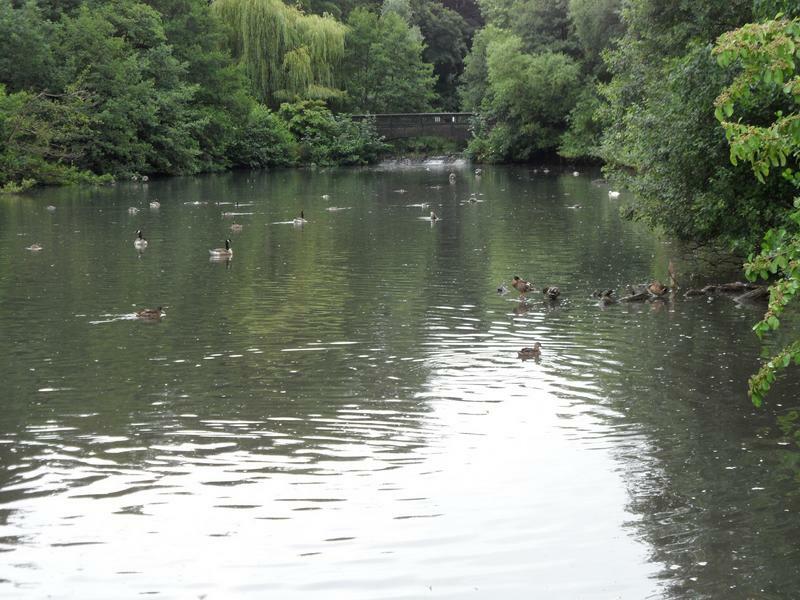 The bottom pond is quiet today. 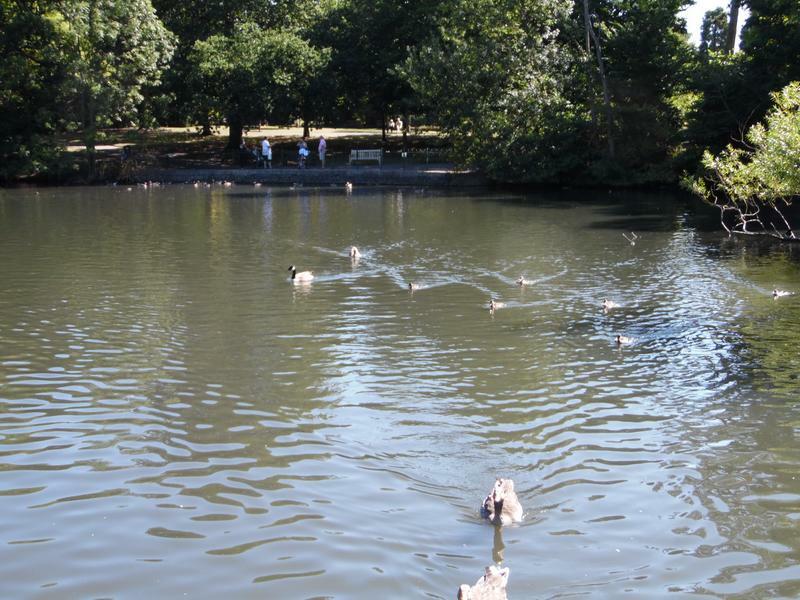 The bottom end of the main lake. 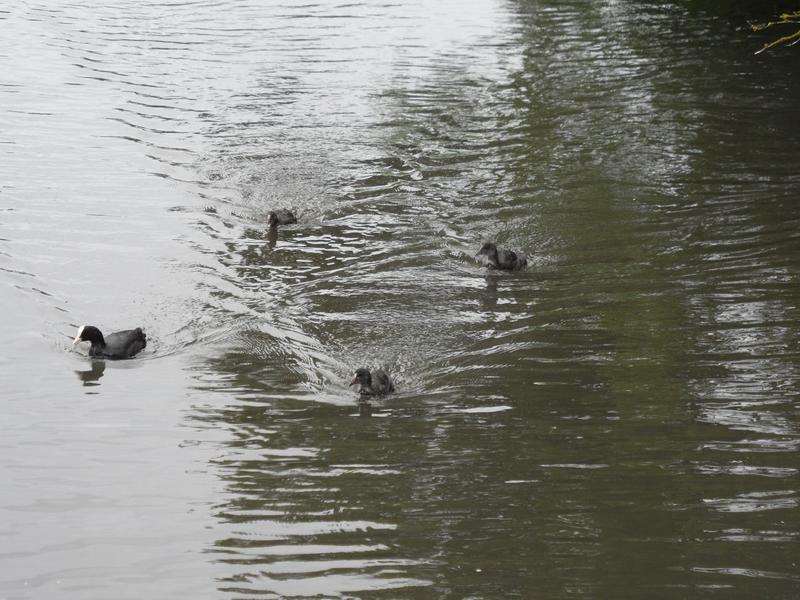 A few Tufted Ducks on the main lake. 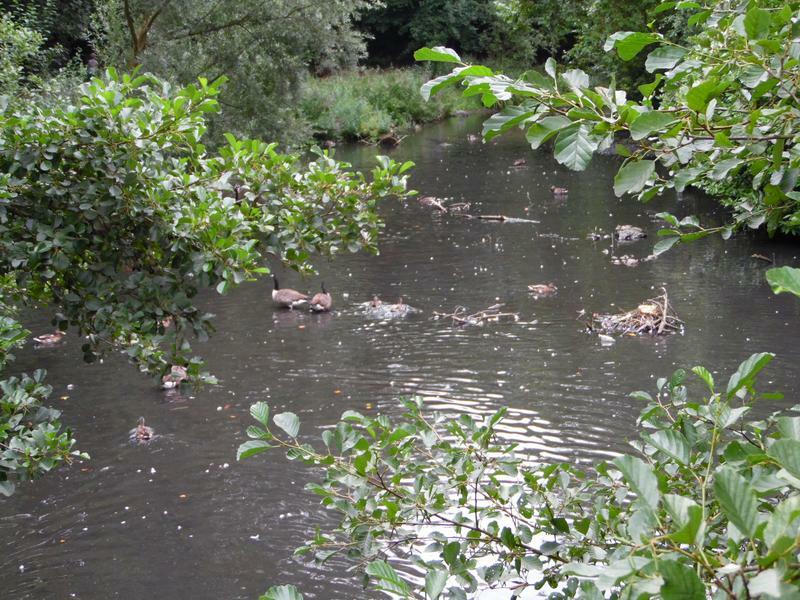 And several herons on their island. 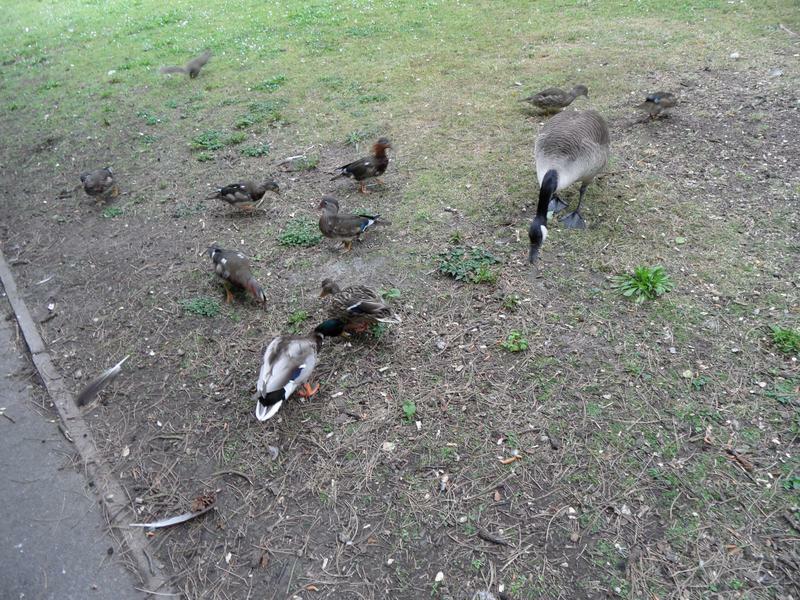 Unfortunately they eat ducklings. 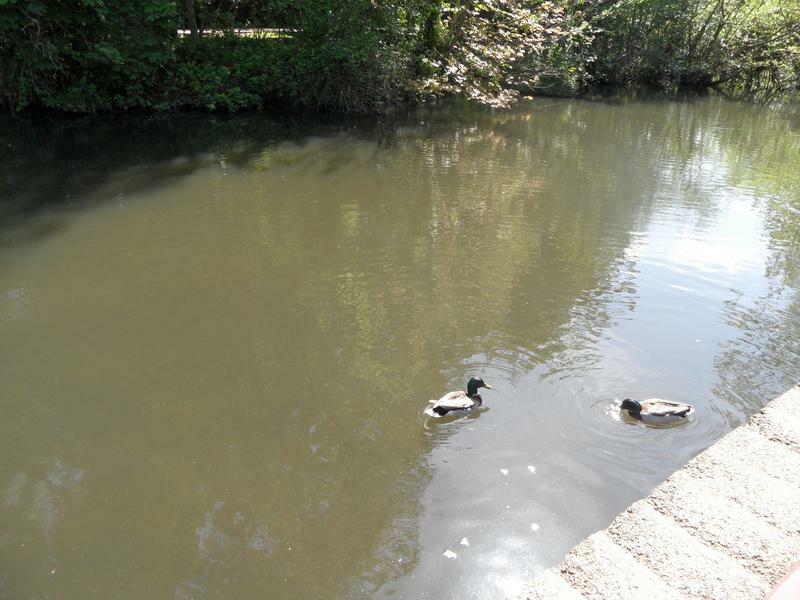 17th May 2015, the top pond is quiet, just two Mallards and no sign of the ducklings we saw a month ago. 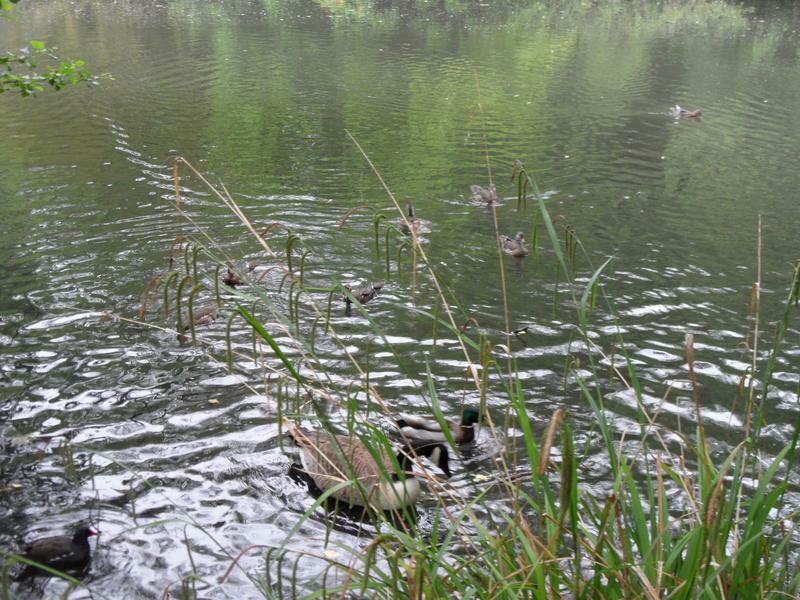 The next pond is quiet again, usually get lots of ducks and geese rushing up here looking for food. 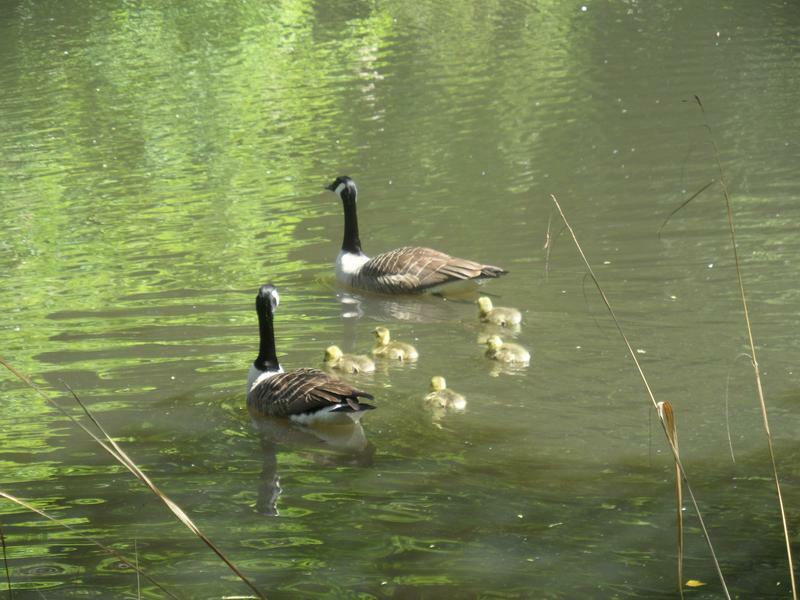 But this pond has the first Canada Geese goslings of the season. 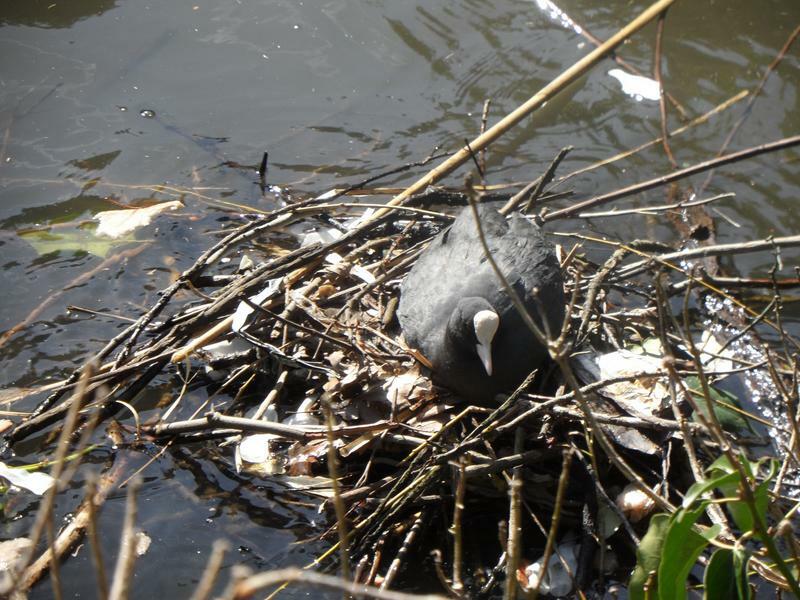 A little further up, a new Coot nest. 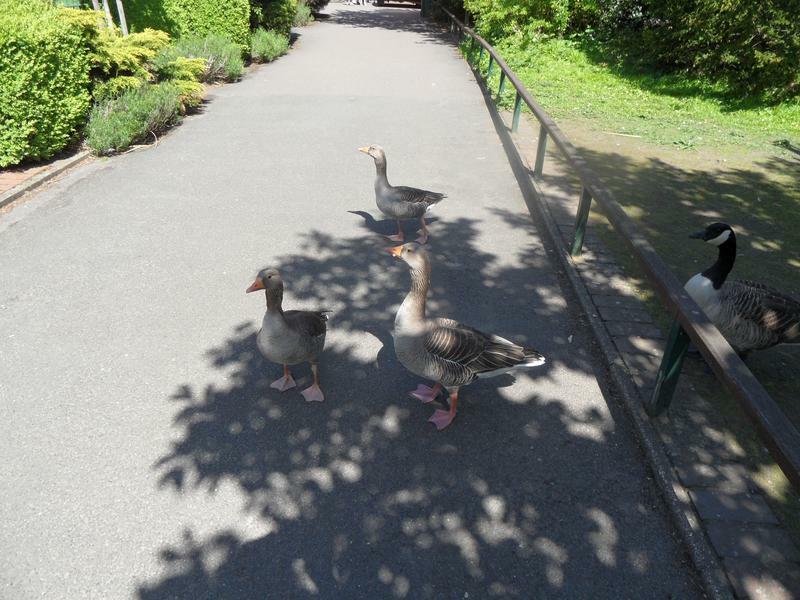 Several Greylag Geese on the path by the main lake. 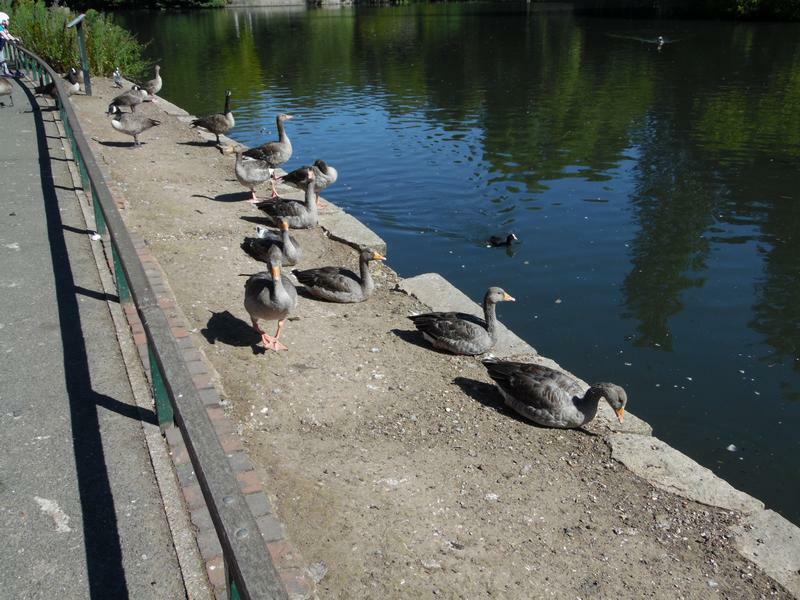 They often wait here for food. 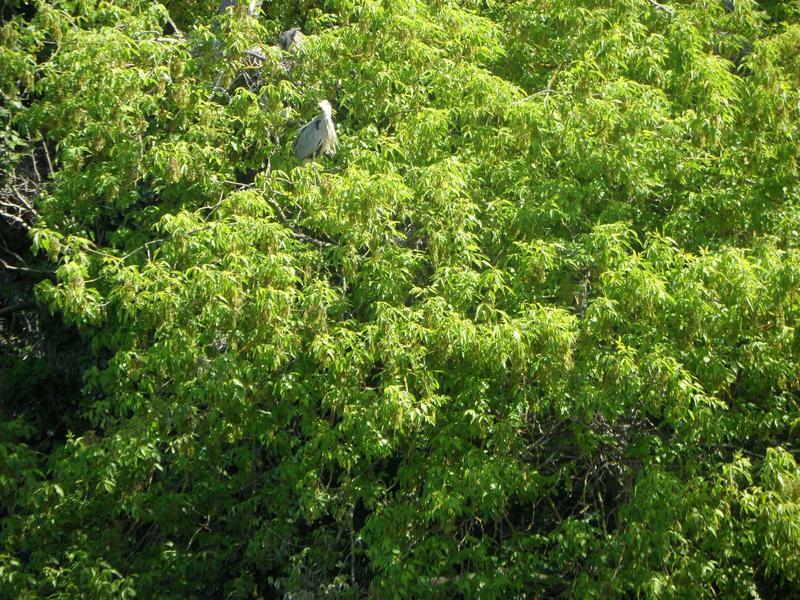 A heron atop a tree on Heron Island. 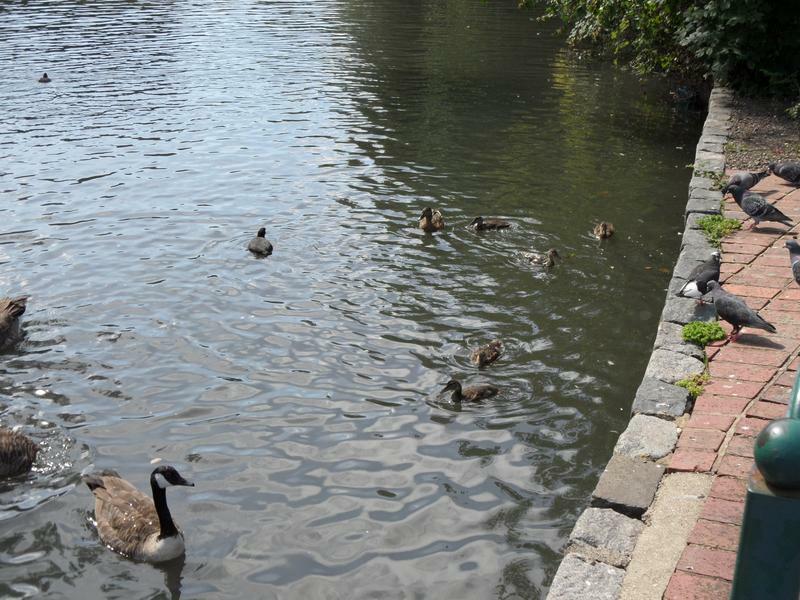 But by the edge, a Coot family. 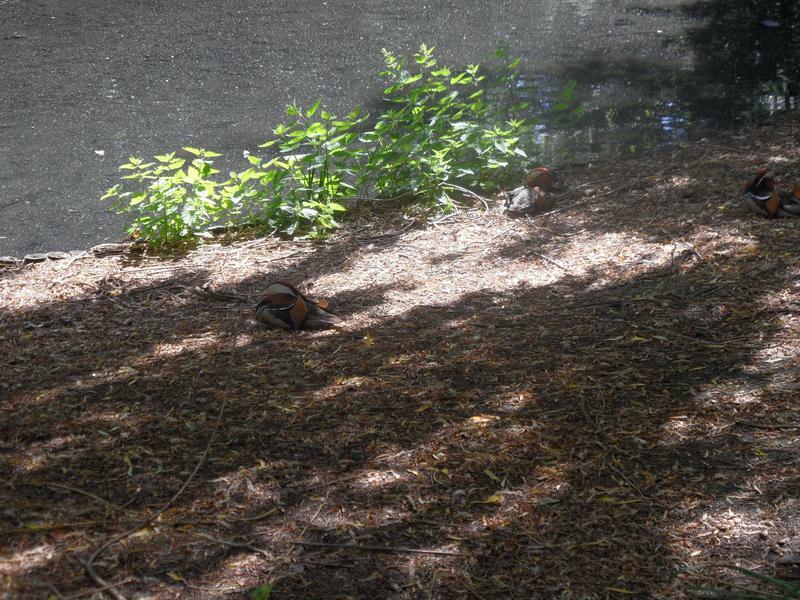 Two Mandarin ducks sleeping by the bottom pond. 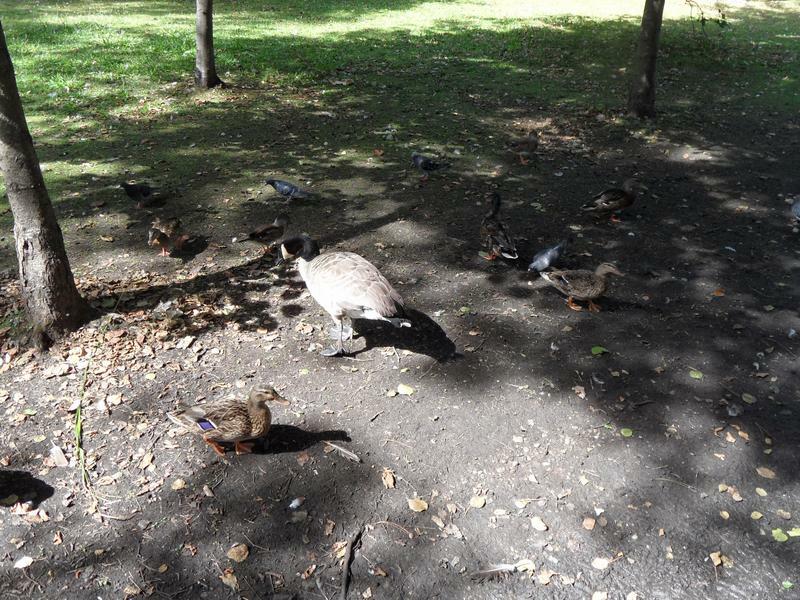 Usually have dozens of Canada Geese here, but not today. 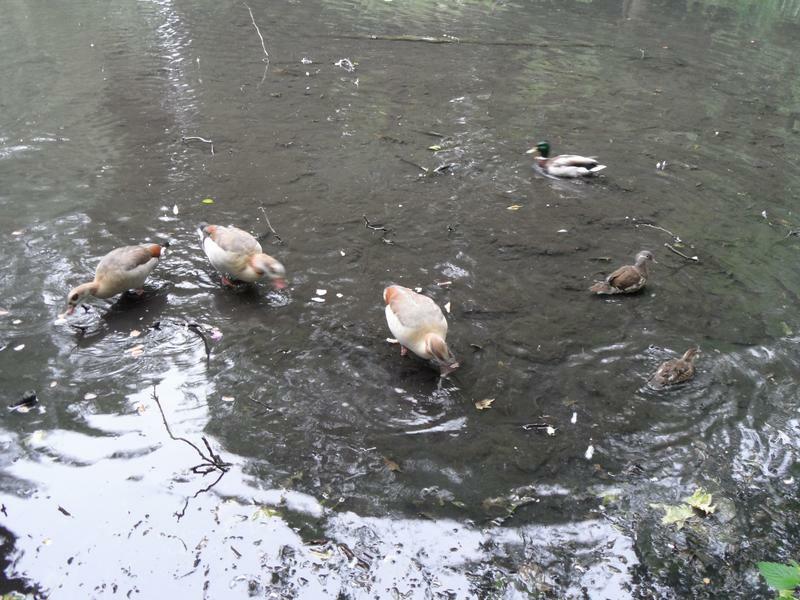 More Mandarin Ducks on the bottom pond. 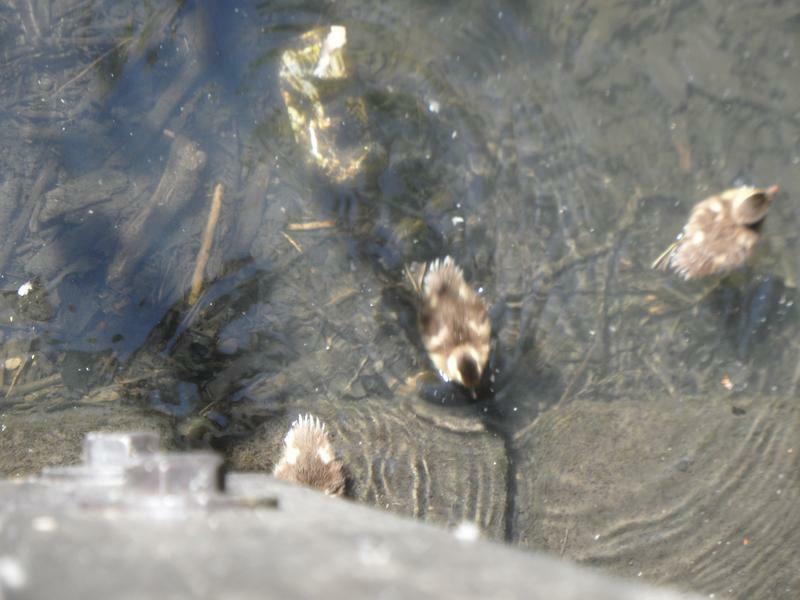 Sorry a poor photo, but Mandarin ducklings under the bottom bridge. 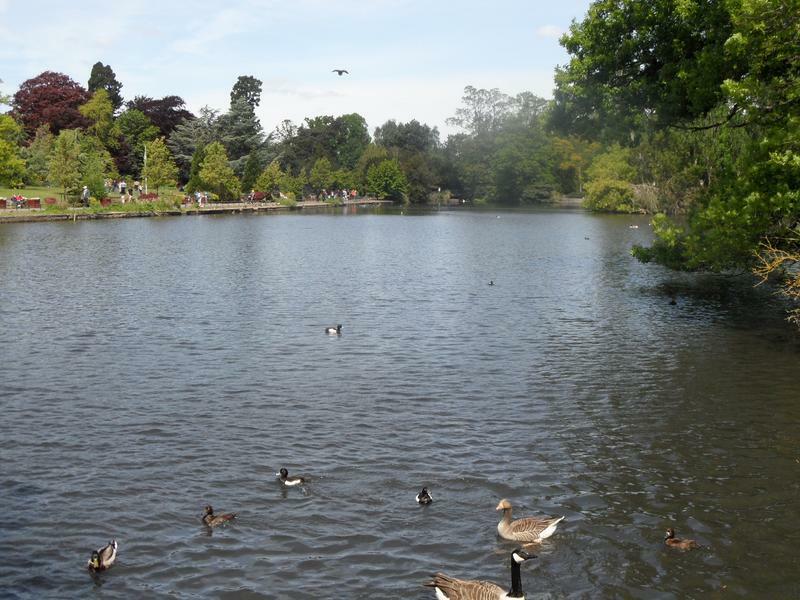 Another view of the main lake. 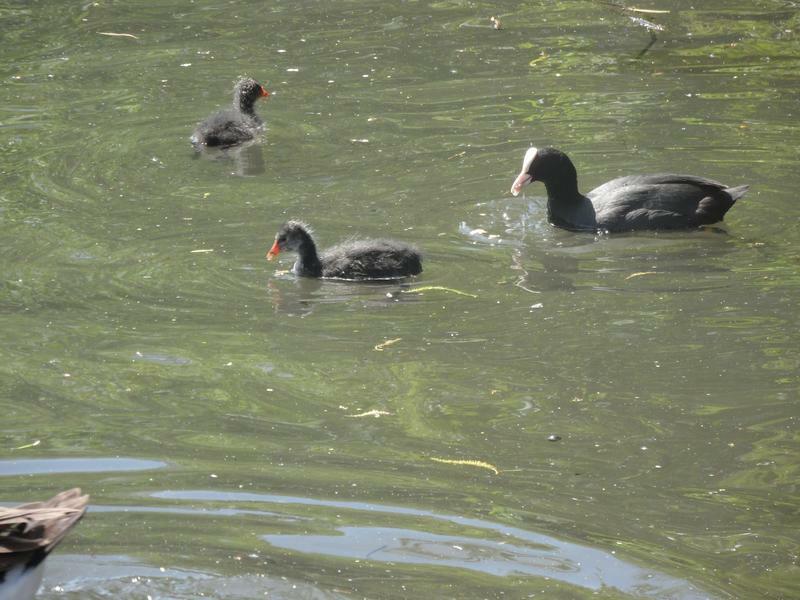 And by the edge another Coot family. 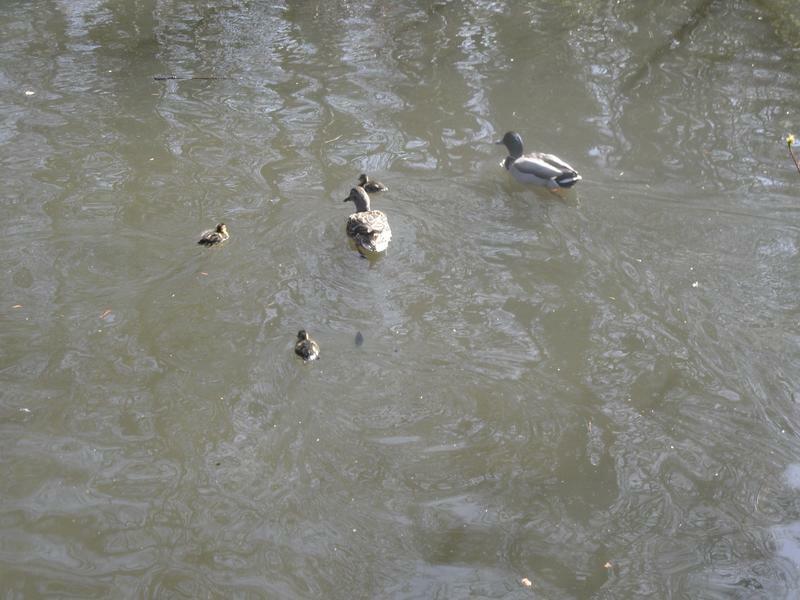 Near Heron Island, a Mallard family, five ducklings. 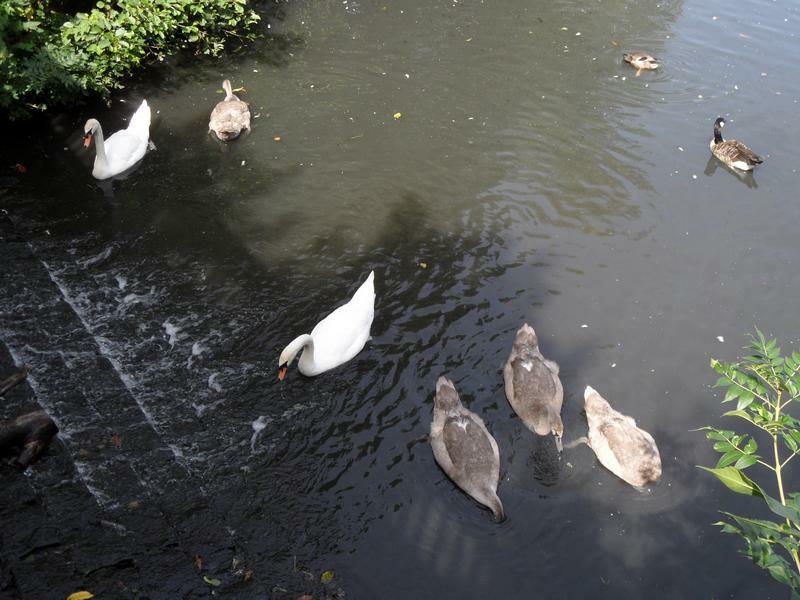 And a Swan family, five cygnets..
Who all swim towards me for food. 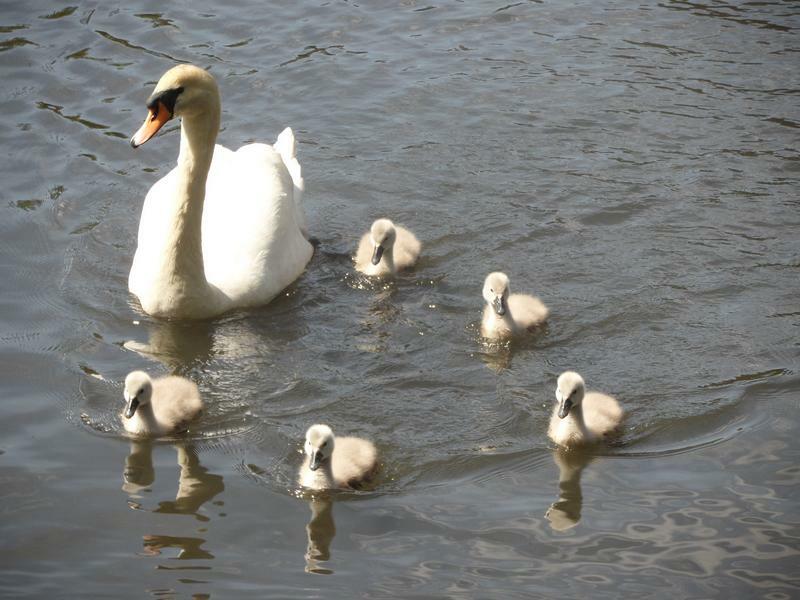 Last year only a single cygnet survived, hope it's more than one this year. 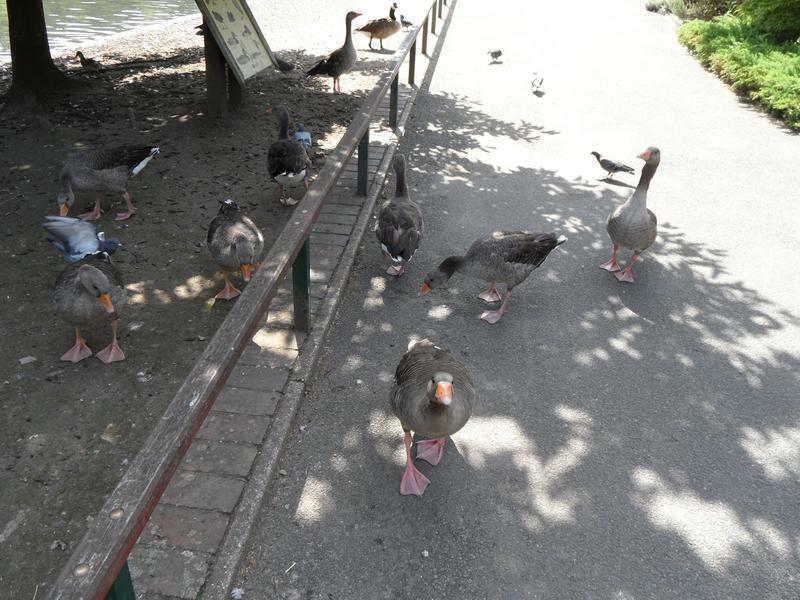 Daddy arrives to eat duck pellets. 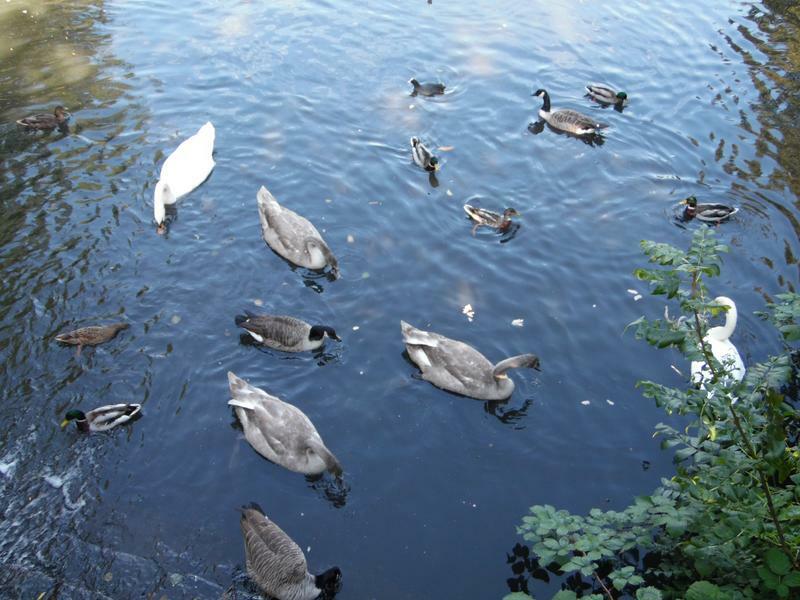 The duck pellets are small, ideal for small birds, but the large Swans have to shovel them up. 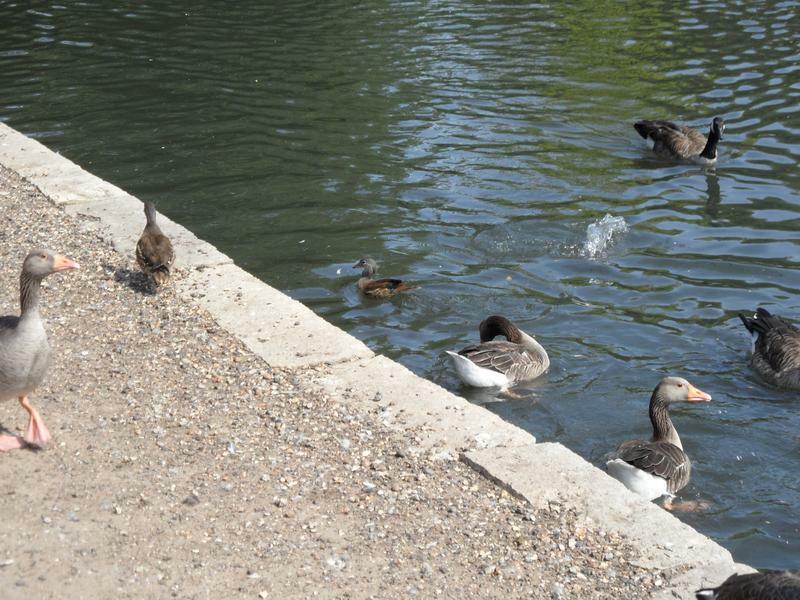 So lots of breeding in the park this spring, Mallards, Canada Geese, Mandarins, Coots and Swans, many too close to Heron Island, unfortunately. 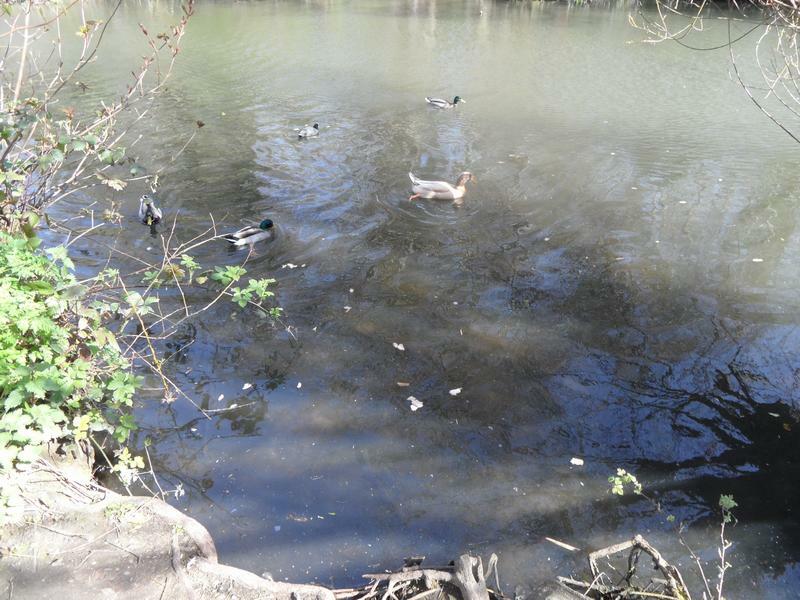 on the bottom pond, with a boy Mallard and girl Mandarin. 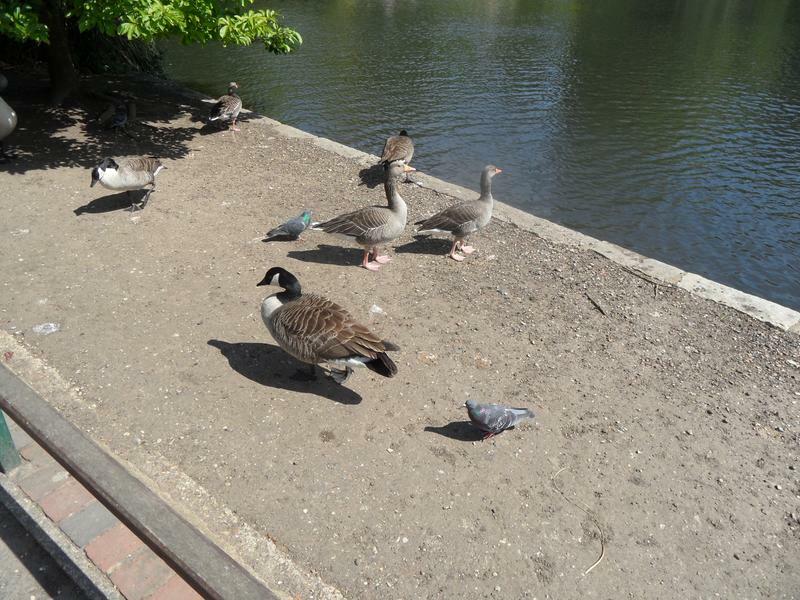 More birds arriving when they realise food is available. 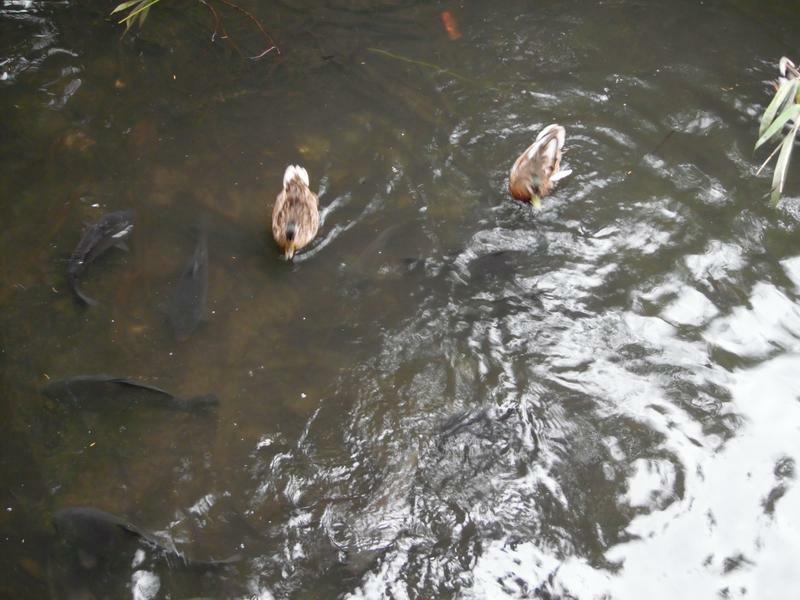 Fed almost a whole loaf of bread on this and the next pond. 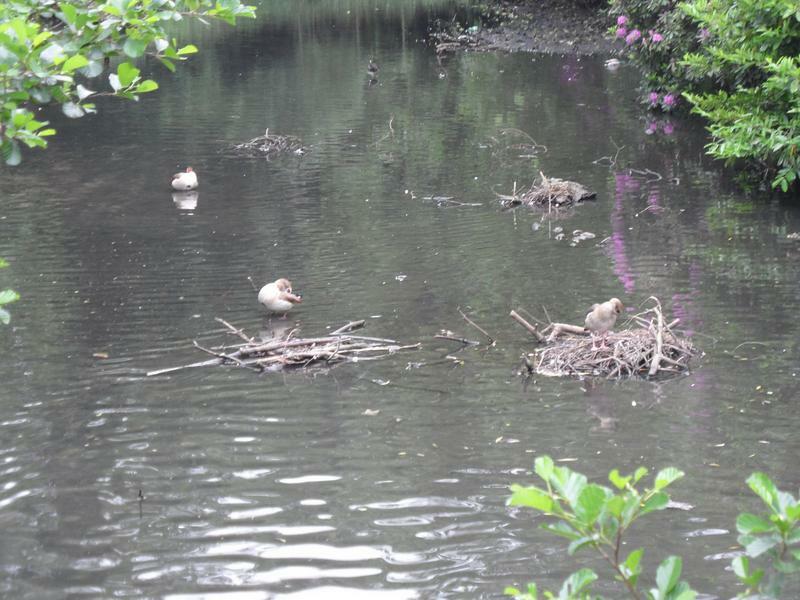 The Egyptian geese seem happy to take over Coot nests. 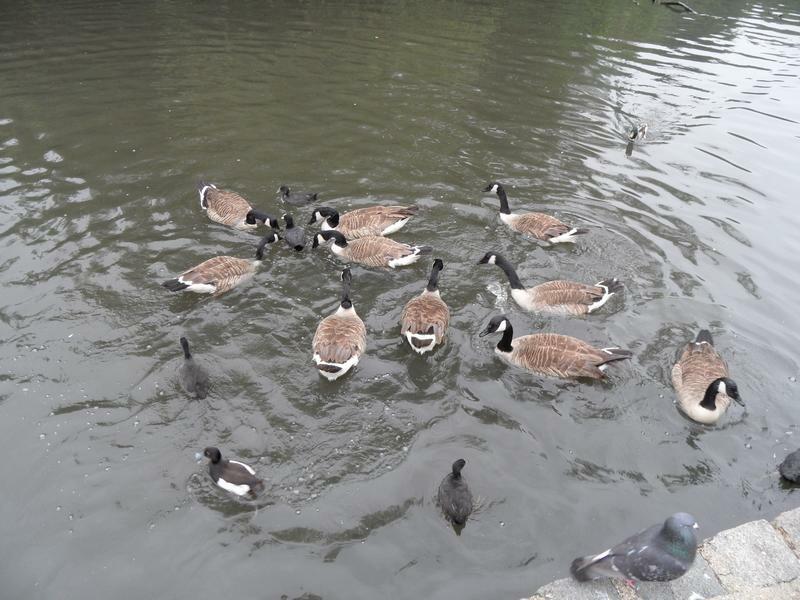 Canada Geese, Mallards, Coots and Mandarins under the bridge over the bottom lake. 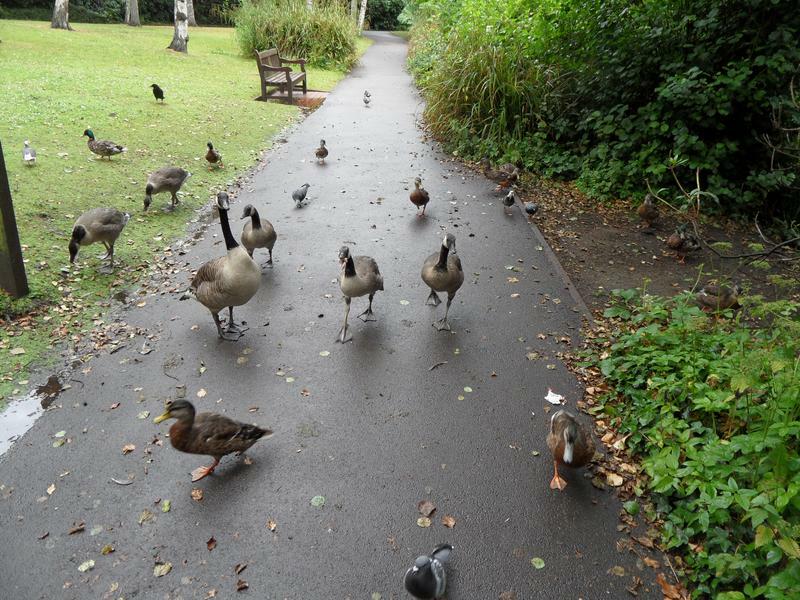 Various hungry geese and ducks follow me up the path. 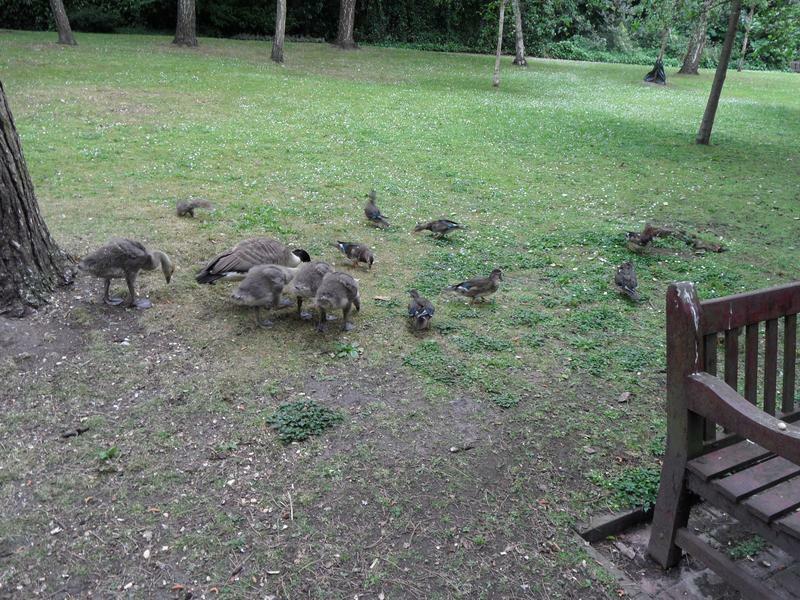 First family of this visit, Greylag Geese with six goslings, three or four weeks old. 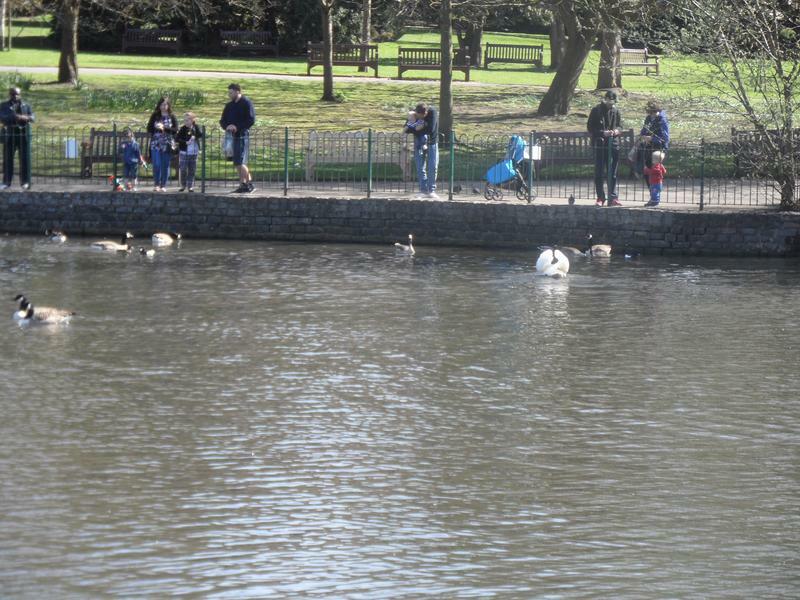 Over that fence is the main lake and island, normally lots of people feeding on the far side by the playground, but quiet today. 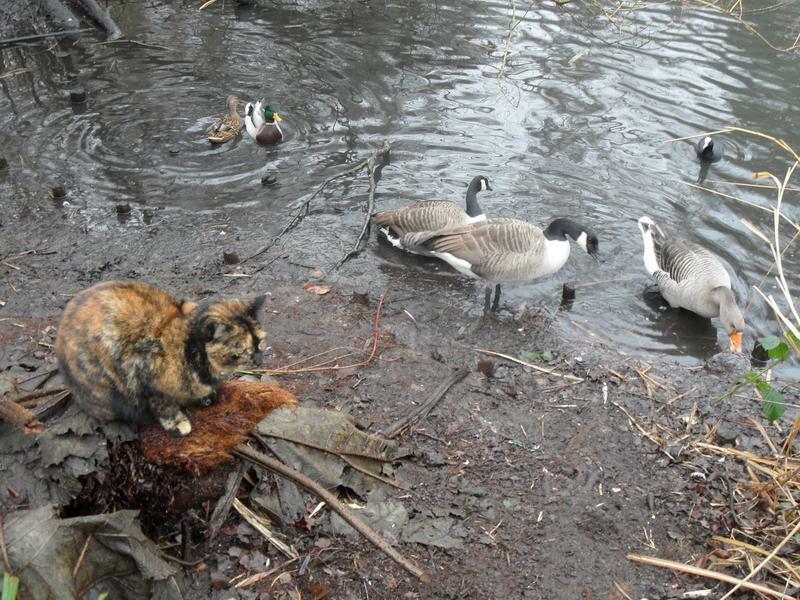 Canada Geese fighting for food, Coots trying to get out of the way. 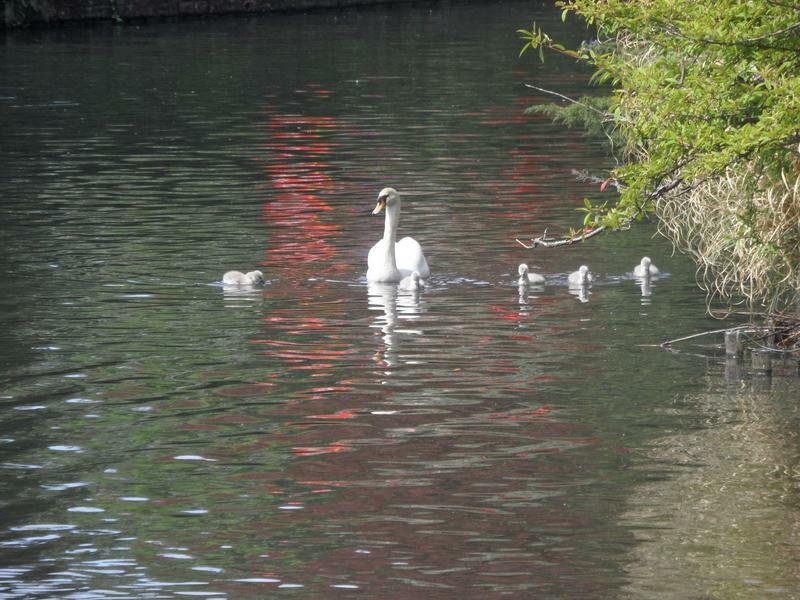 Only saw one swan this visit, hopefully the five cygnets that were here last time are safe and sleeping on an island. 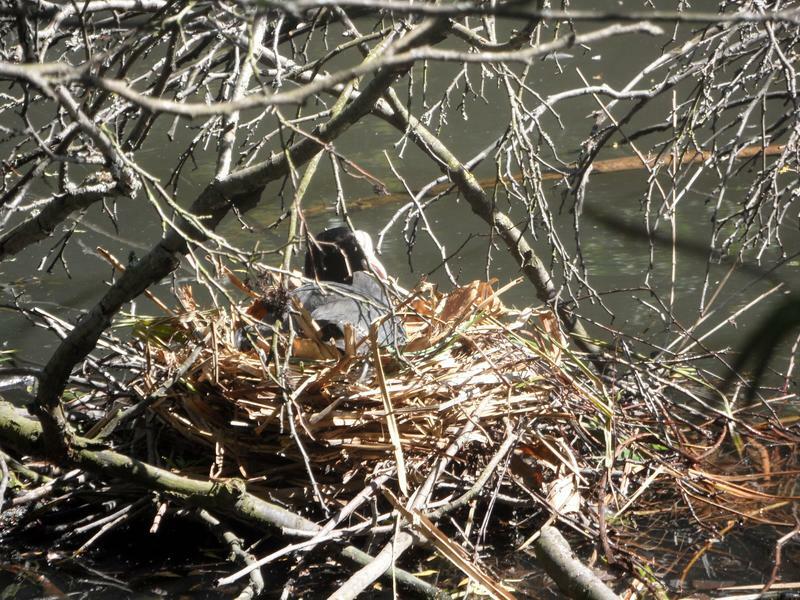 season, now much quieter than when the nests were full of hungry chicks. 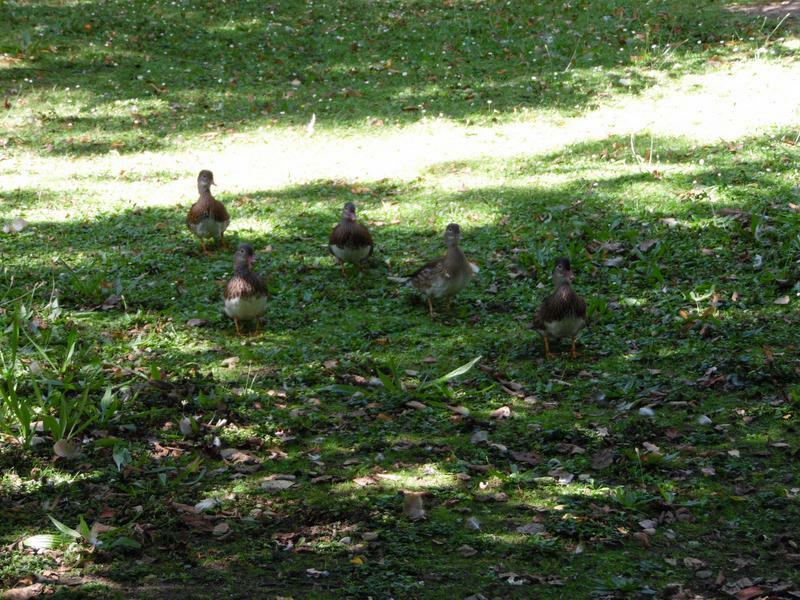 No idea where those chicks went, never seem to see them. 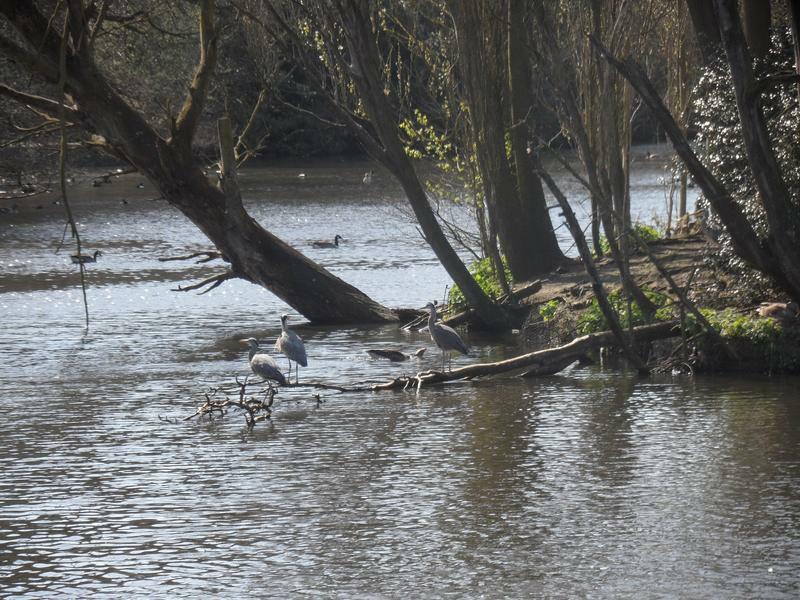 One solitary heron on the stone island. 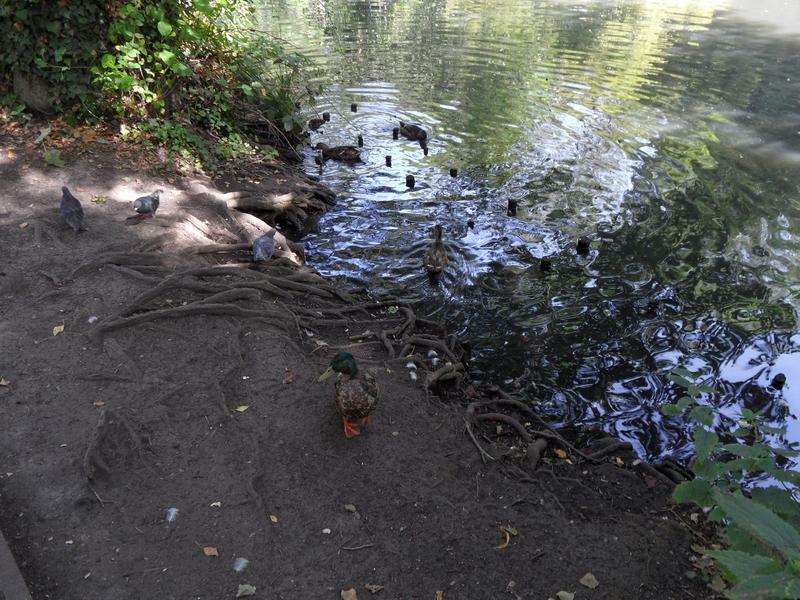 to tell them from girls. 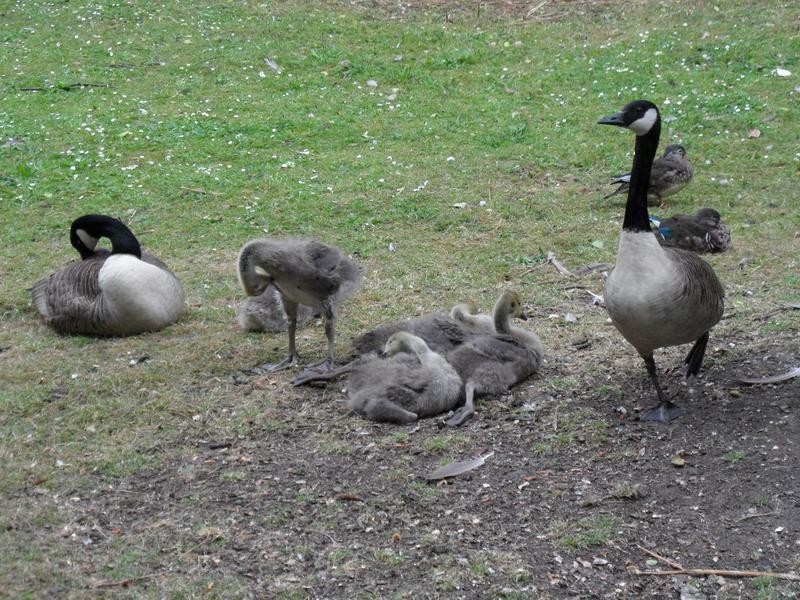 Found another family, this time Canada geese, still sleeping. 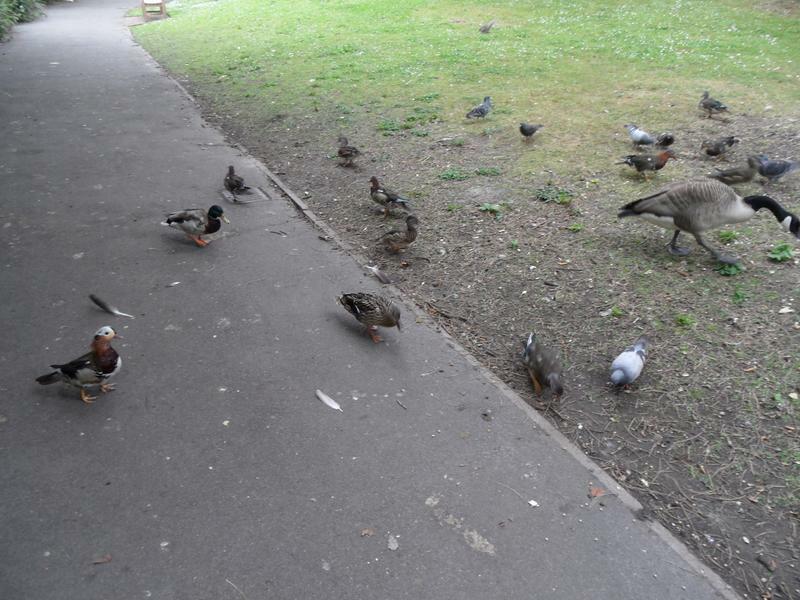 But quite happy to eat ducks pellets which is all I have left, with the Mandarin ducks. 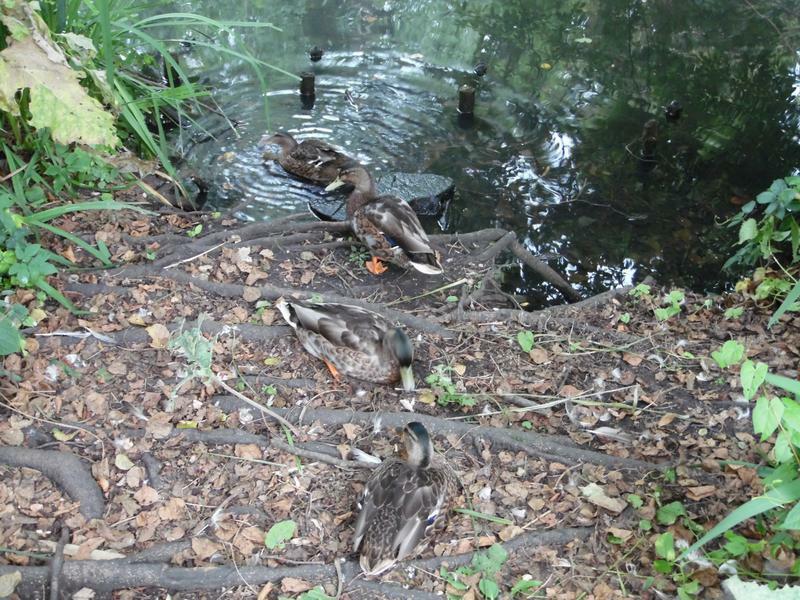 A Mallard pair and more Mandarins. 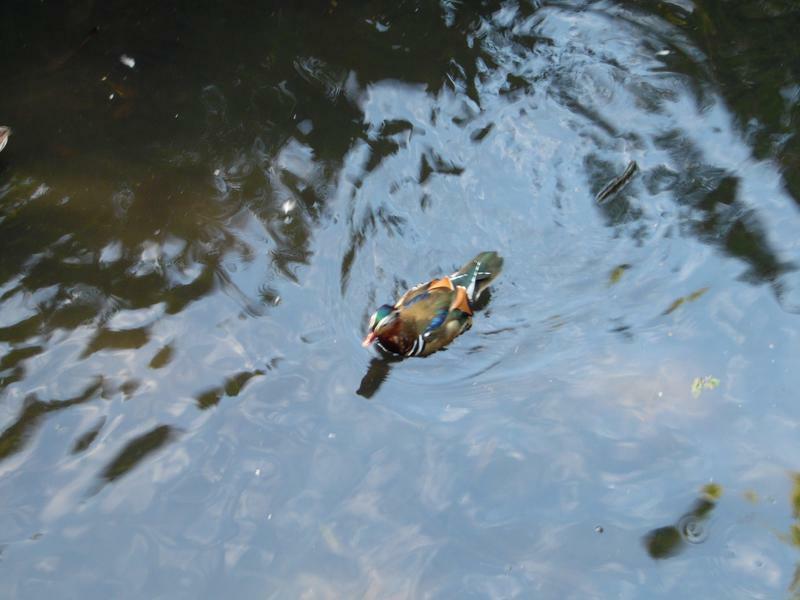 One Mandarin still has most of his winter colours. 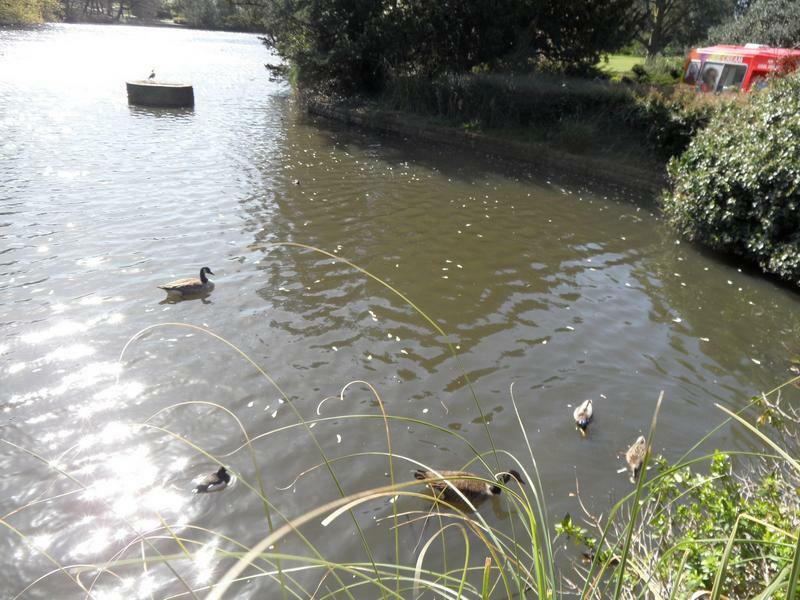 Coots, ducks and geese on the upper lake. 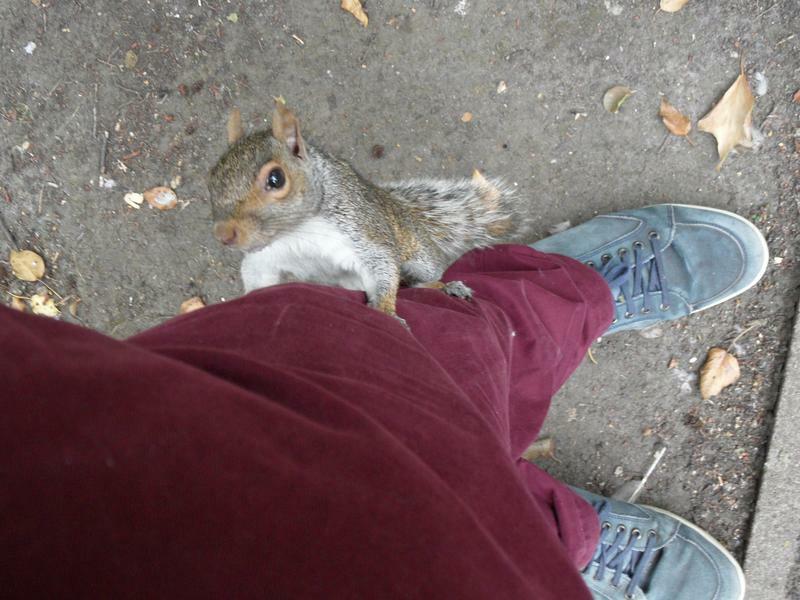 This hungry squirrel climbs my leg looking for food, unfortunately forget to bring peanuts this week. 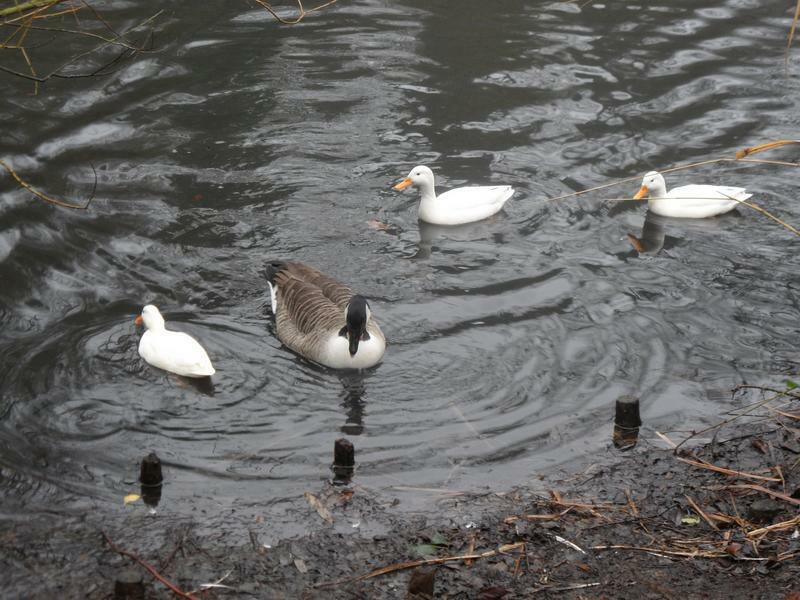 More geese and ducks on the top pond. 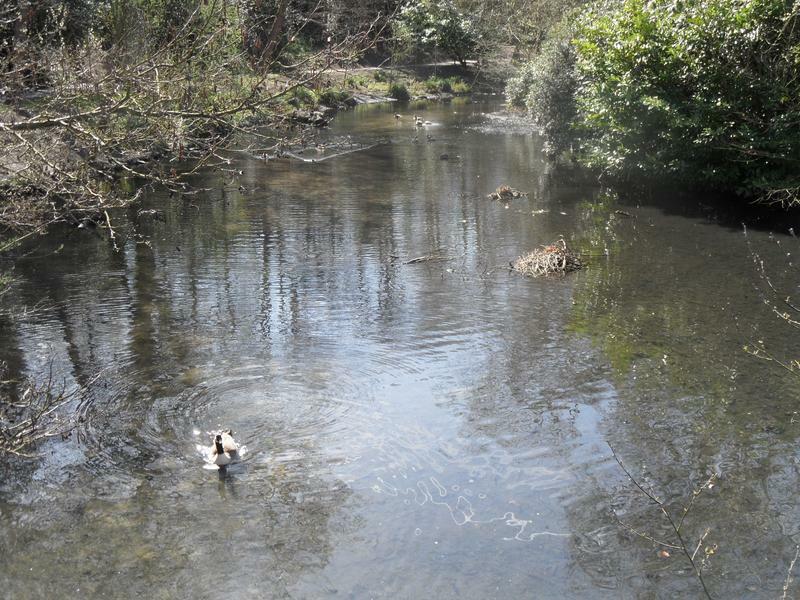 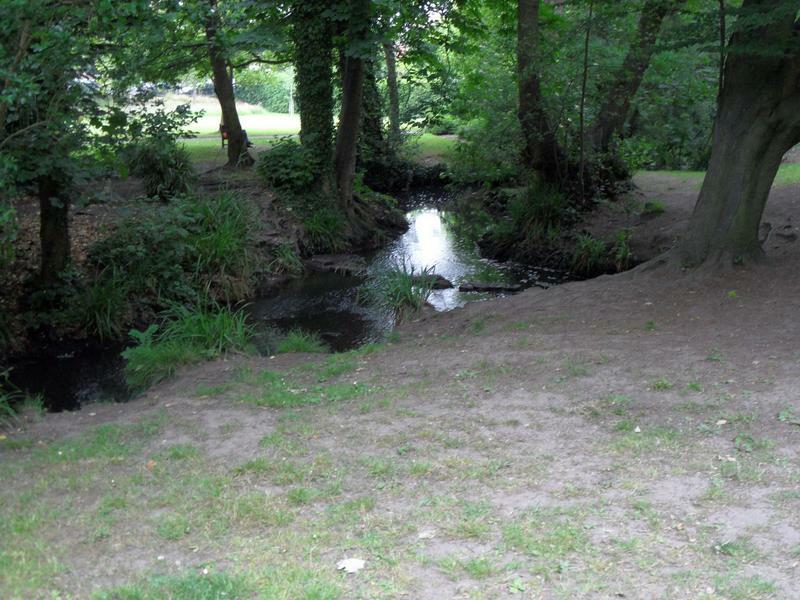 The stream that leads north out of the park, there was a Mallard family here a few weeks ago, but all quiet today. 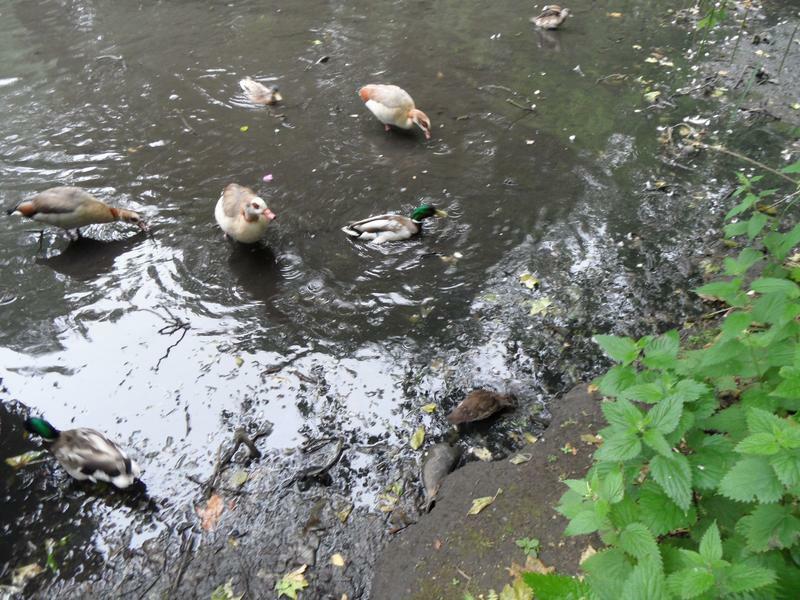 5th July 2015, a lot of Mallards waiting for food near the top pond. 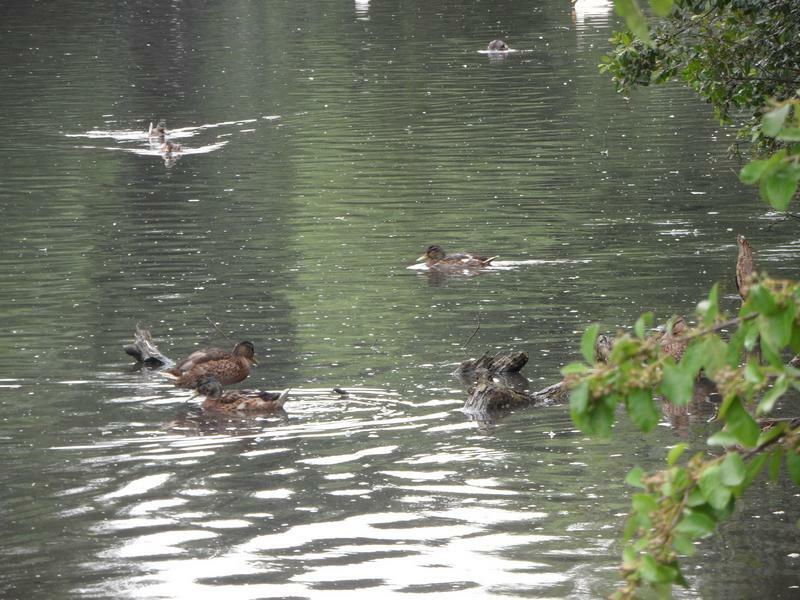 And many more on the top pond, it's all ducks here today, no geese, and not many park visitors either, it's a wet weekend. 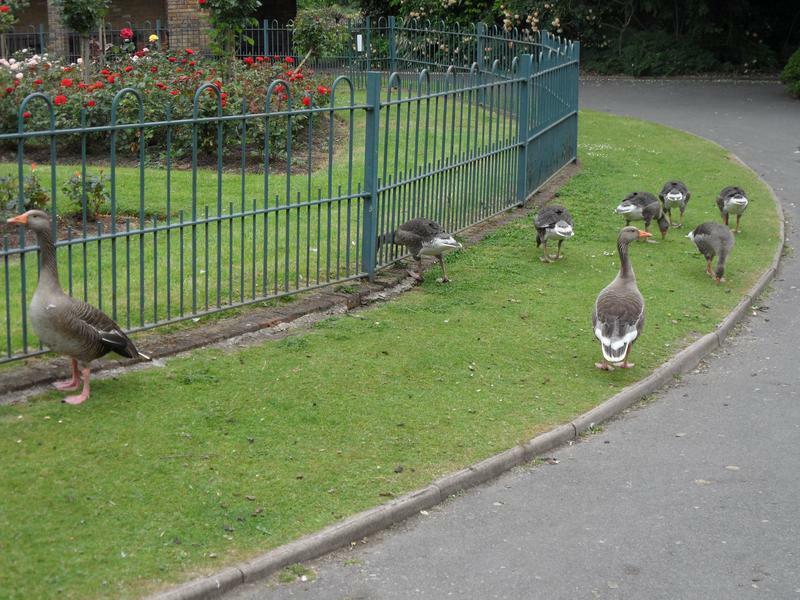 Some geese further down the park, following me down the path. 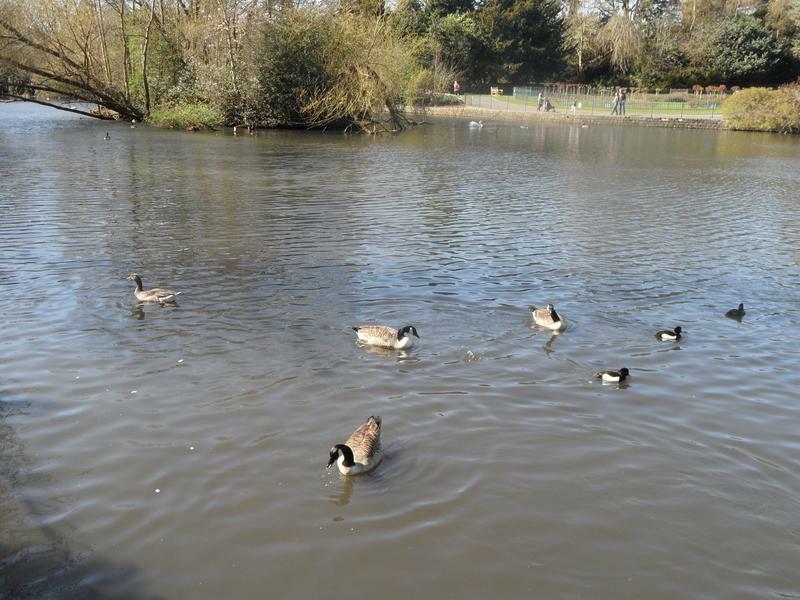 Some geese and ducks on the pond as well. 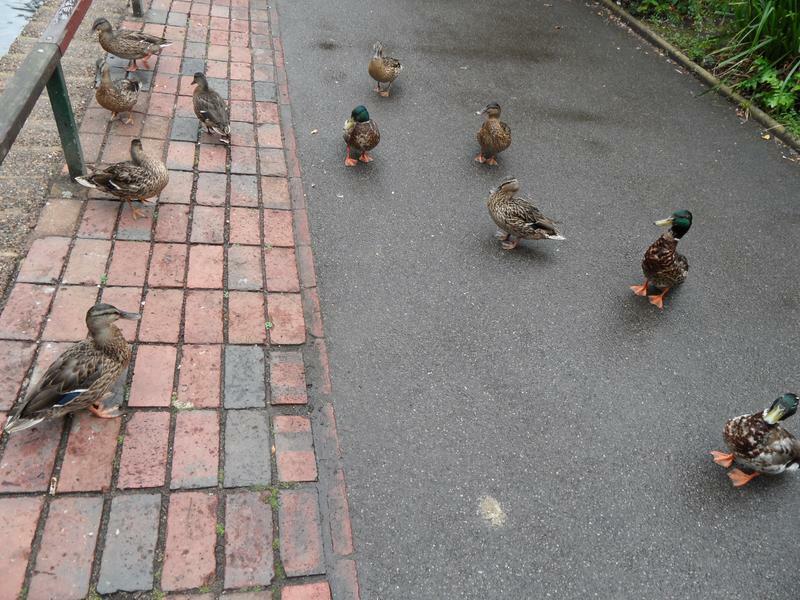 stand out. 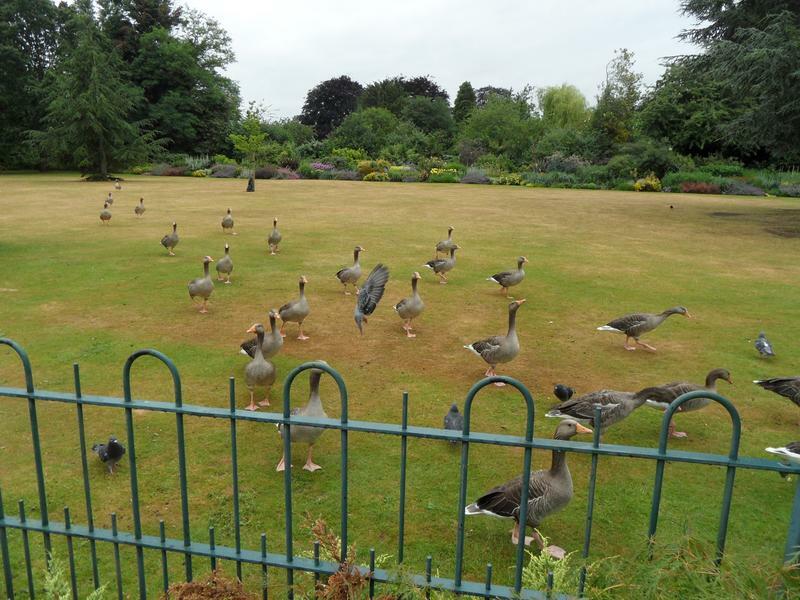 This lawn is supposed to be for picnickers, but been too wet. 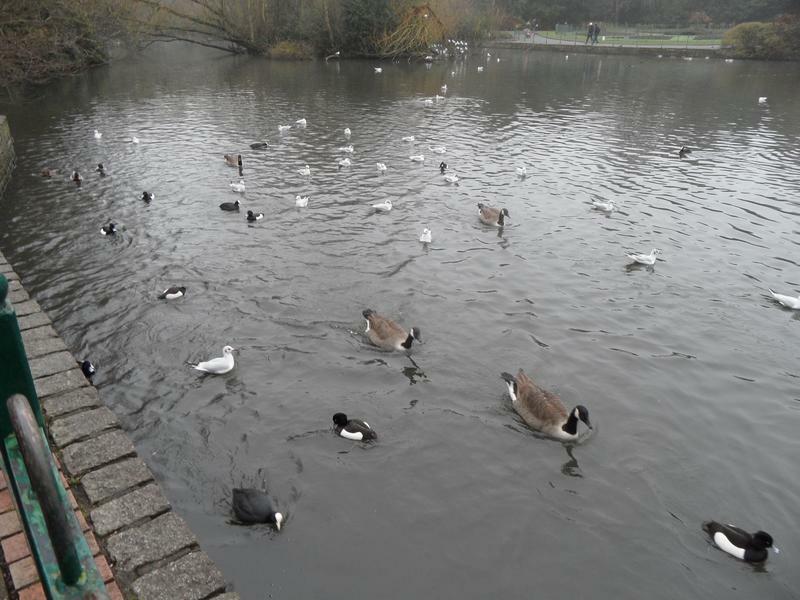 Lots of hungry geese and ducks on the main lake. 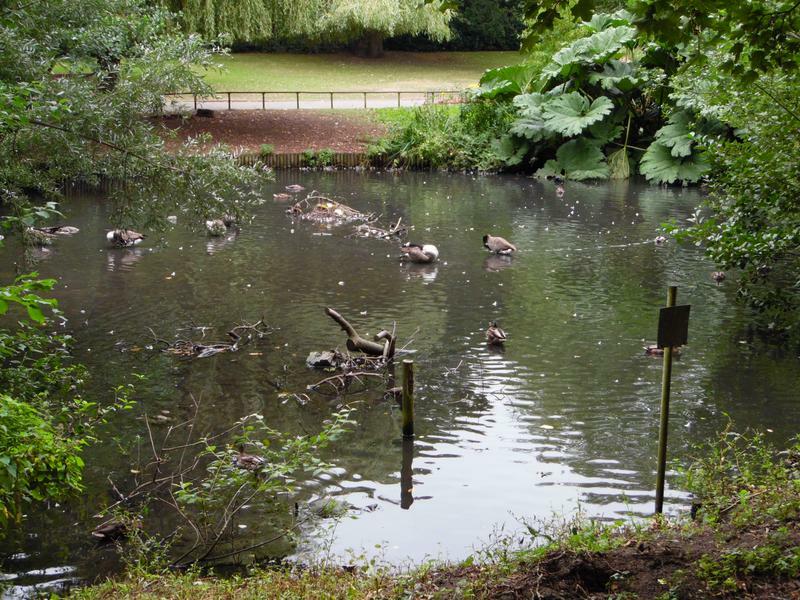 The lower end of the main lake. 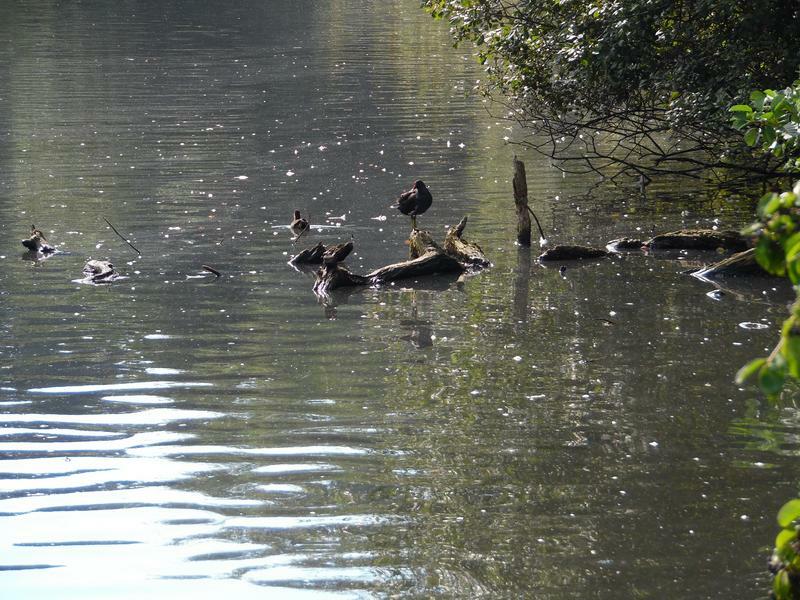 A Mallard family on the log. 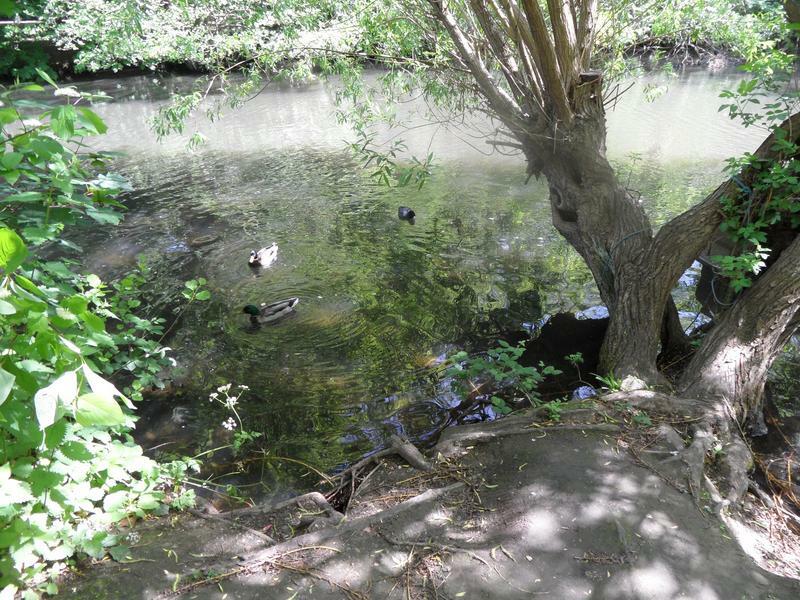 A Mallard family on the log, partially hidden by a branch. 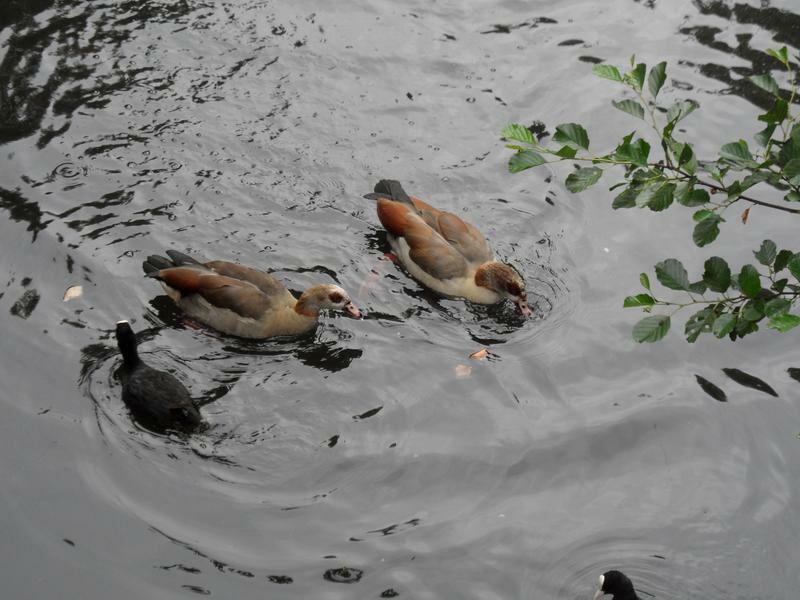 Egyptian Geese on the lower pond. 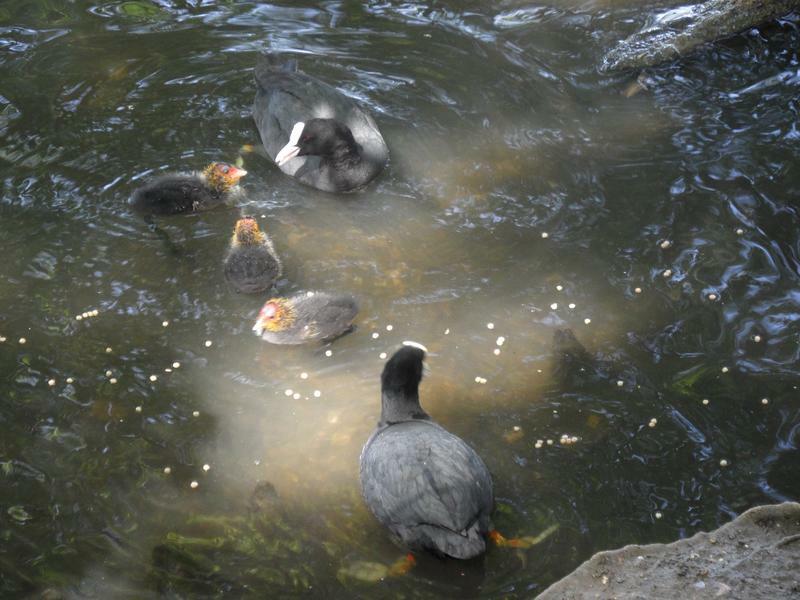 A Coot family on the lower pond. 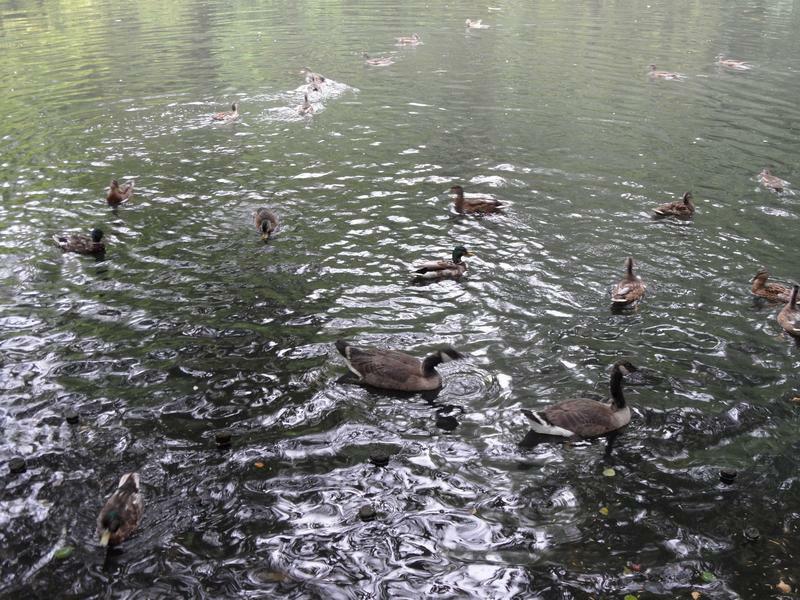 Full circle around the park, the upper pond is now quiet, neither people nor water fowl. 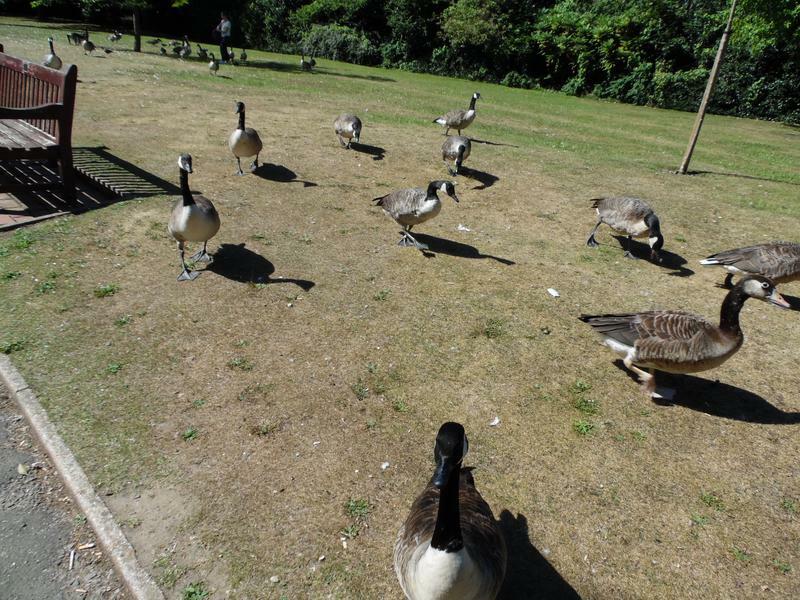 2nd August 2015, brighter weather this visit, lots of hungry birds. 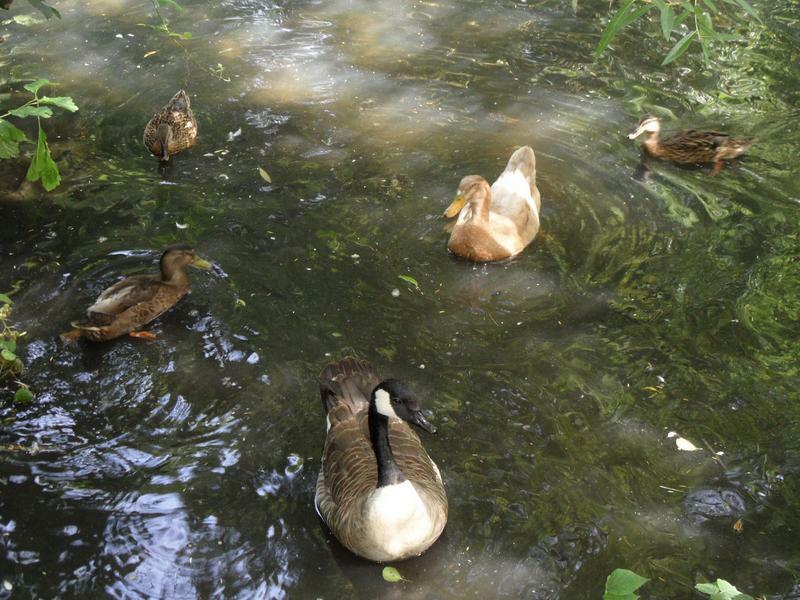 A few ducks and a goose on the upper pond. 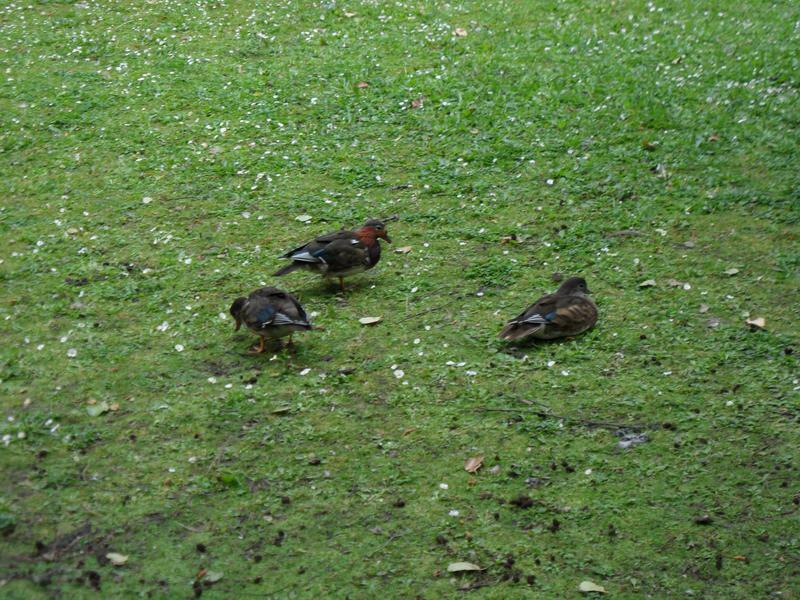 Some Mandarin ducks on the grass. 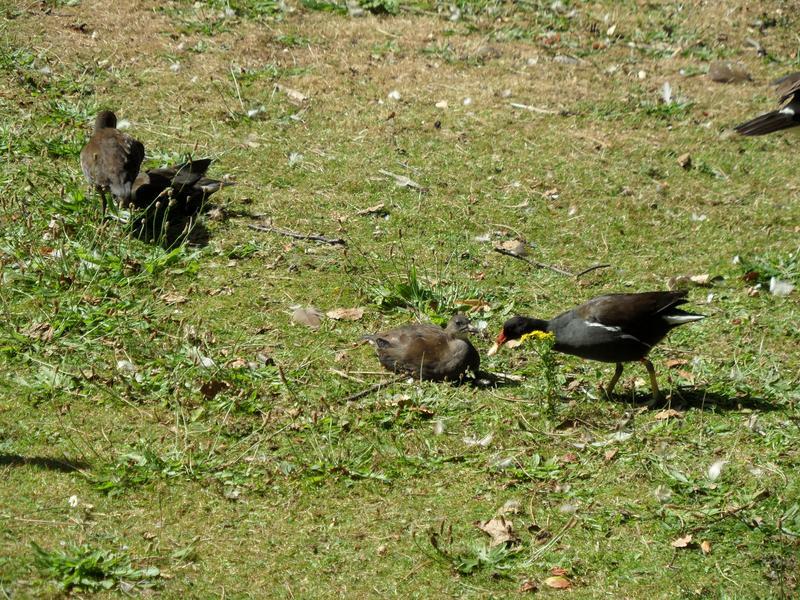 A Moorhen family on the grass. 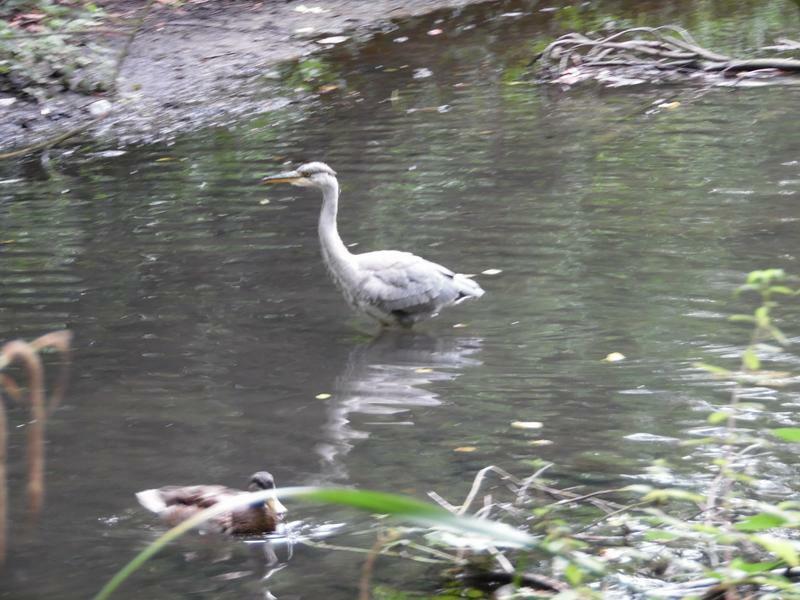 A heron waiting for lunch to swim past. 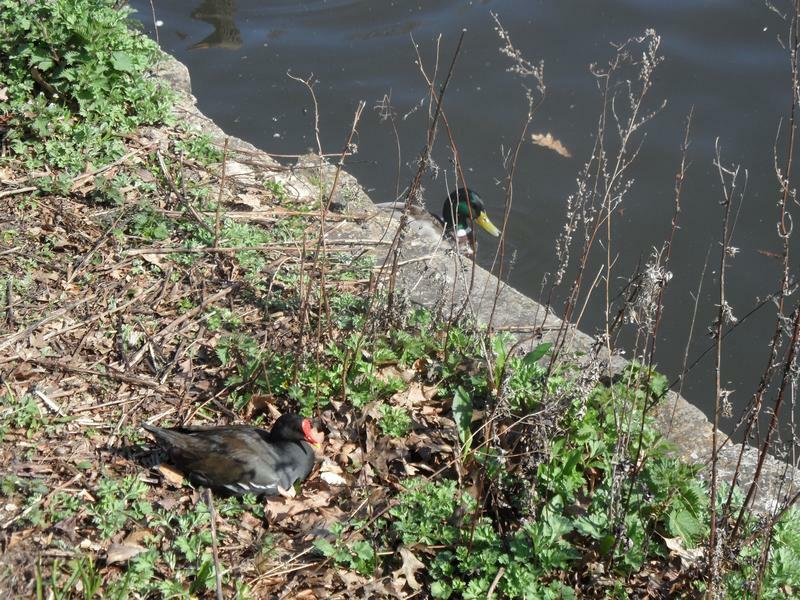 Mother Moorhen feeding a lazy chick. 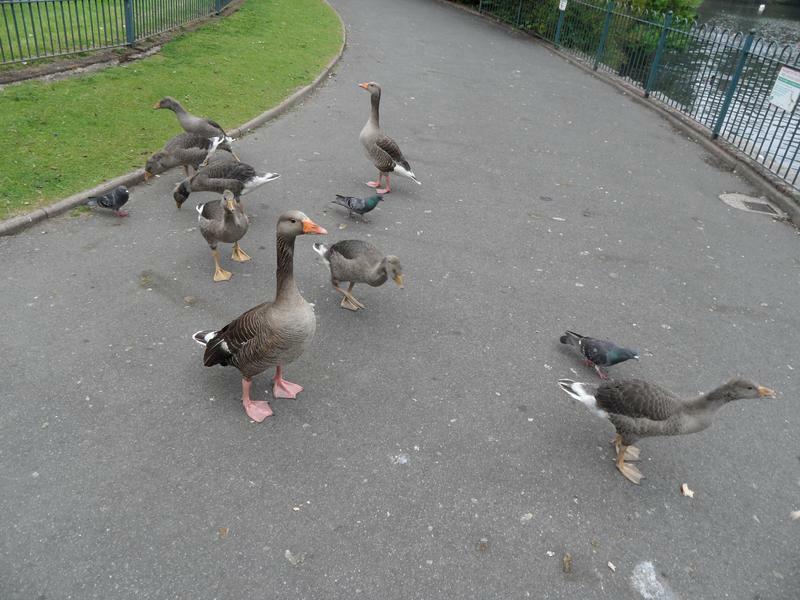 More Greylags on the main lake. 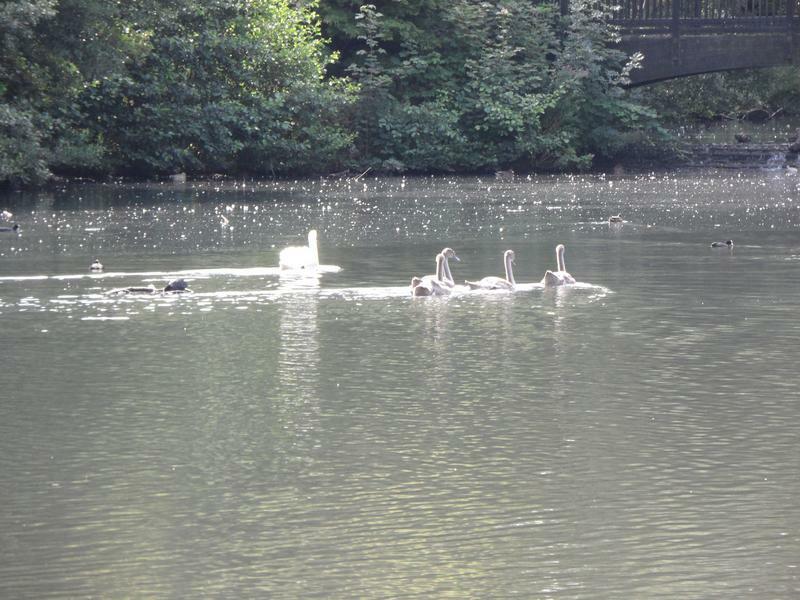 gone, leaving four (last only only one survived). 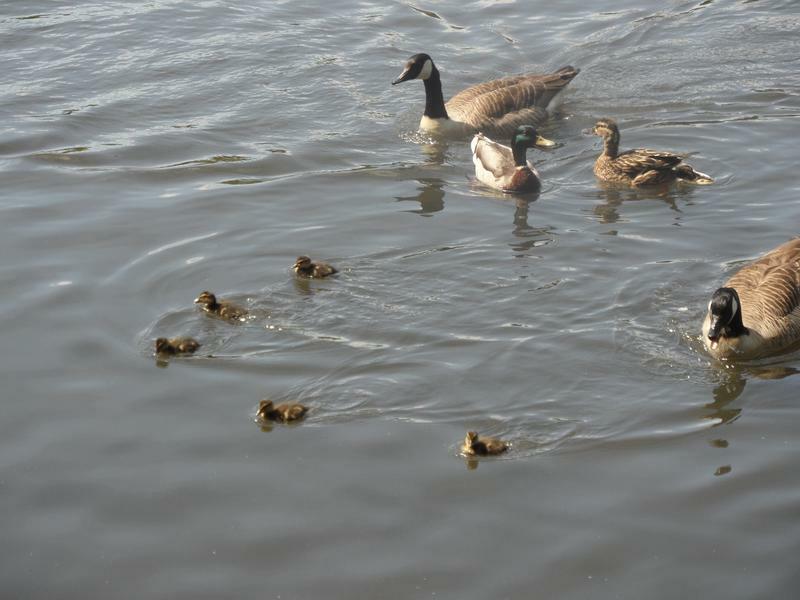 The Mallard family I saw last time on the main lake. 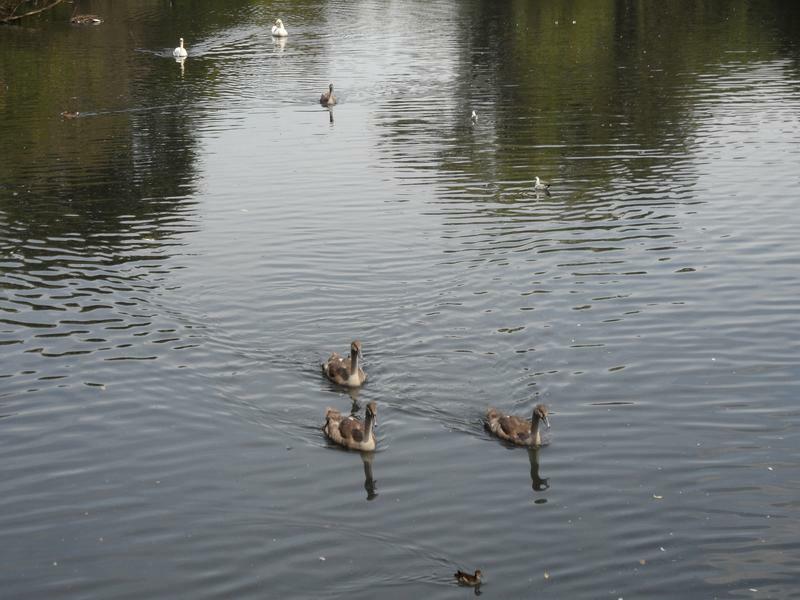 Standing on the bridge over the lake, the six swans head my way. 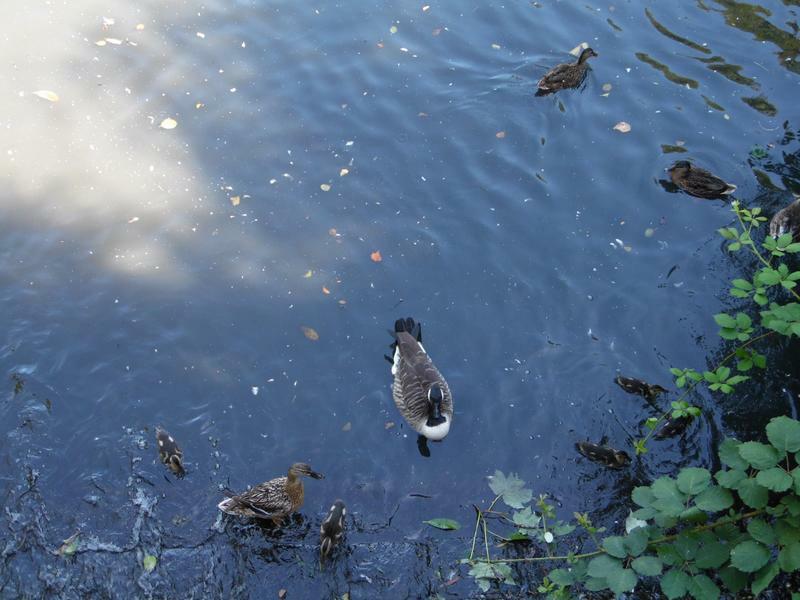 families at the end of July, but it was a late spring. 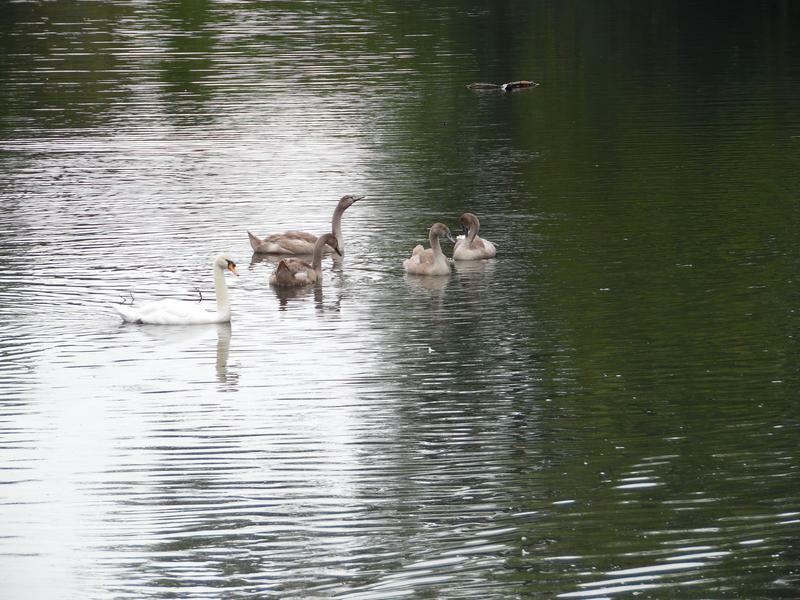 The swan family, not sure when the cygnets get white feathers. .
Mallards have taken over a Coot nest. 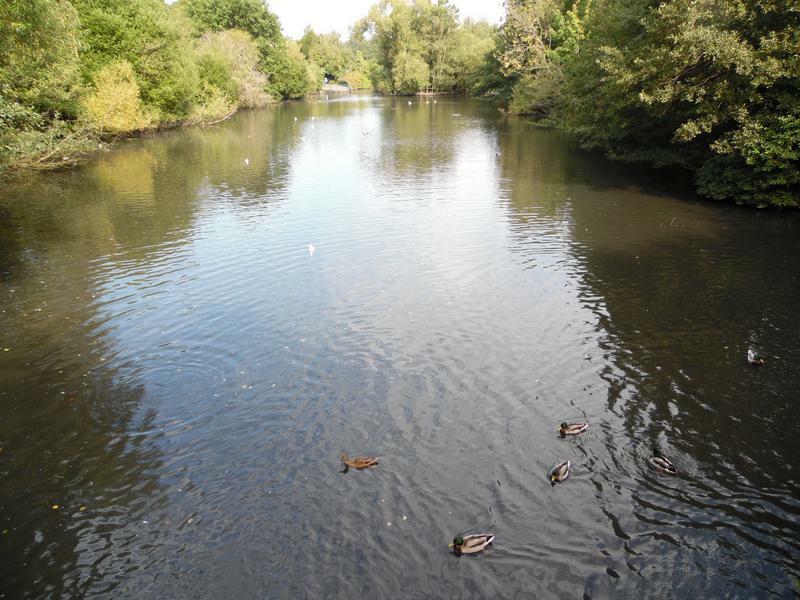 Peaceful on the main lake. 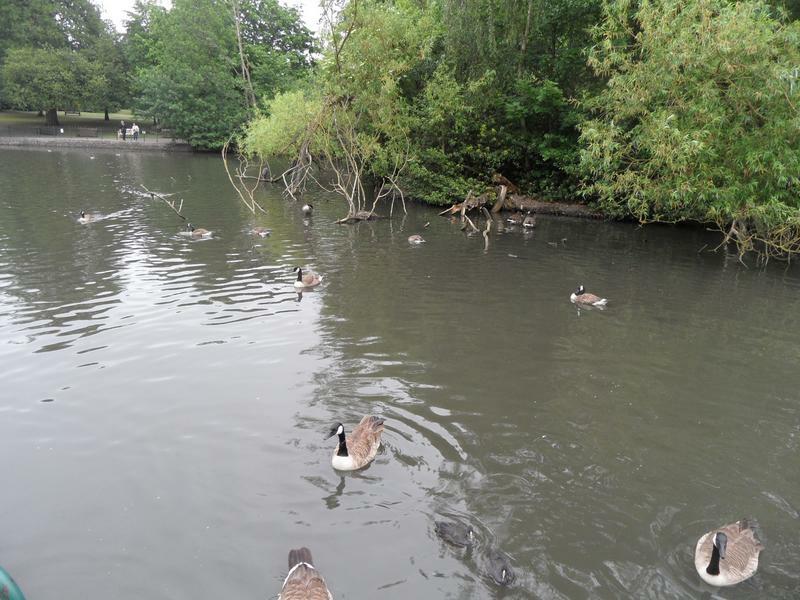 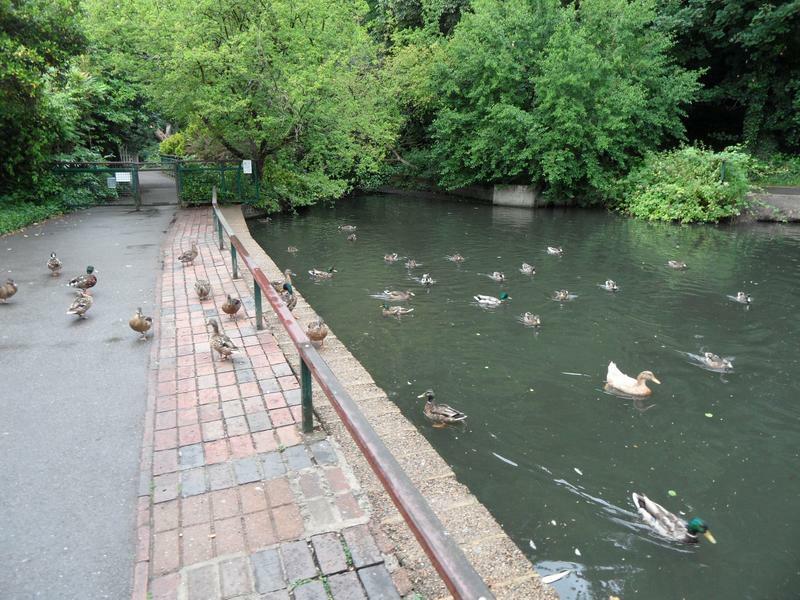 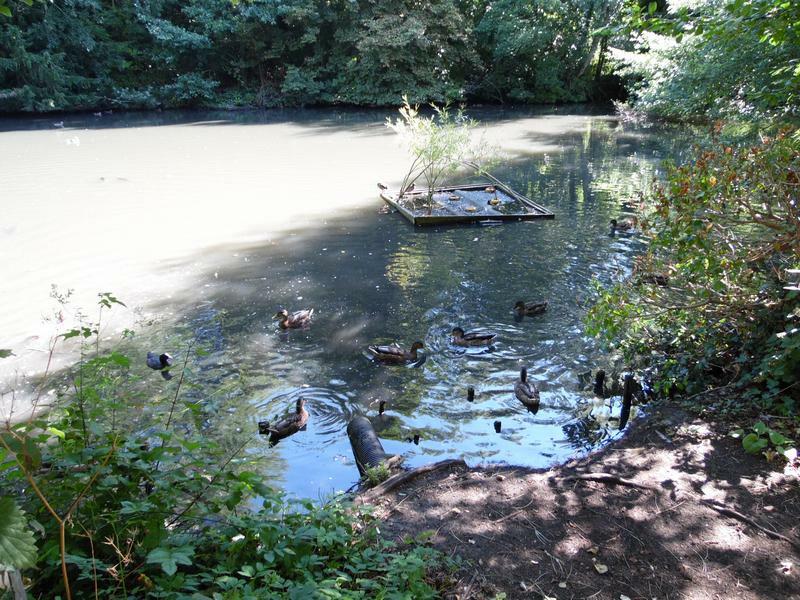 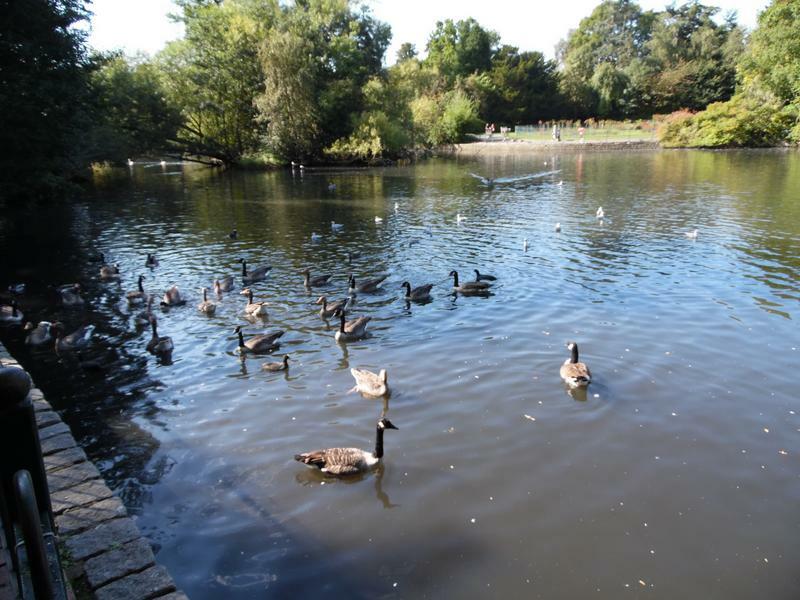 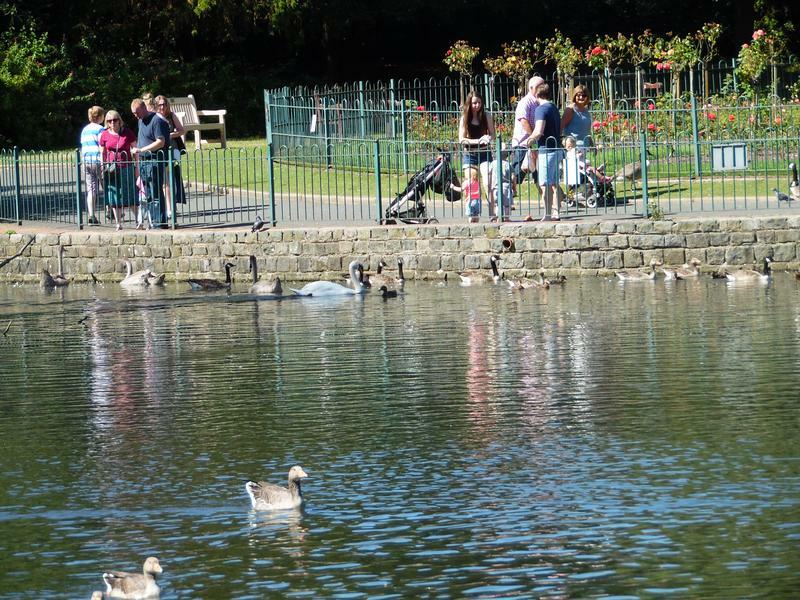 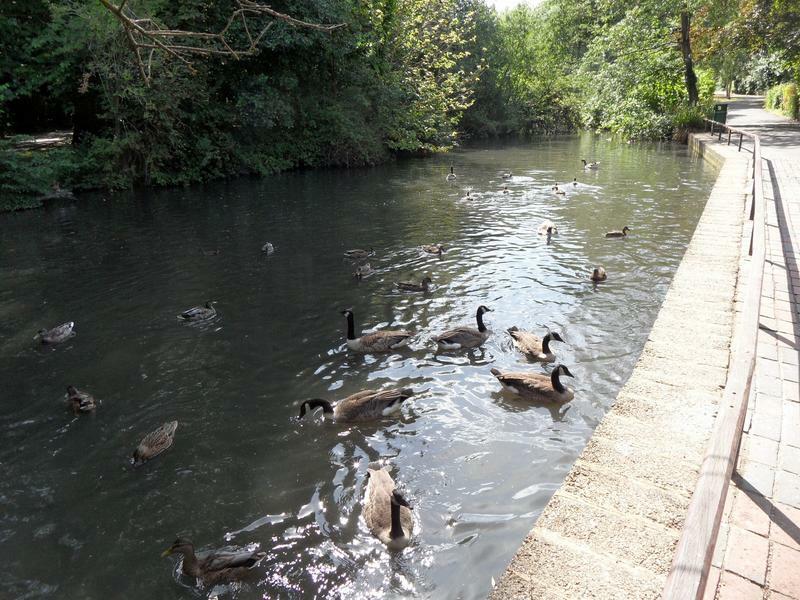 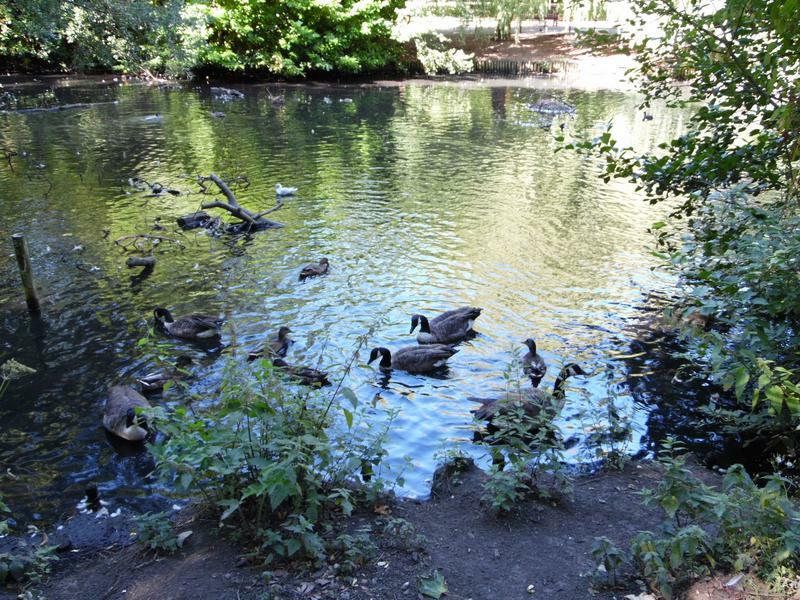 7th August 2015, hungry birds on the lower pond. 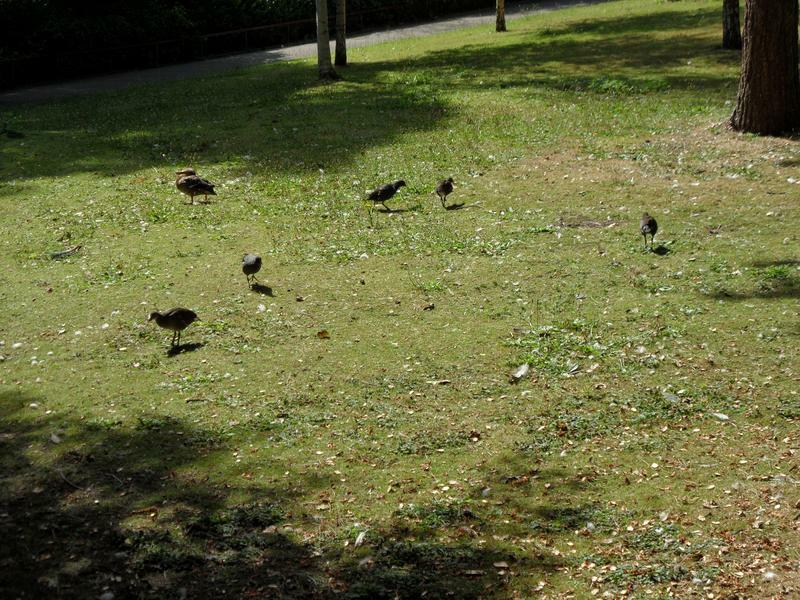 Hungry geese on the grass. 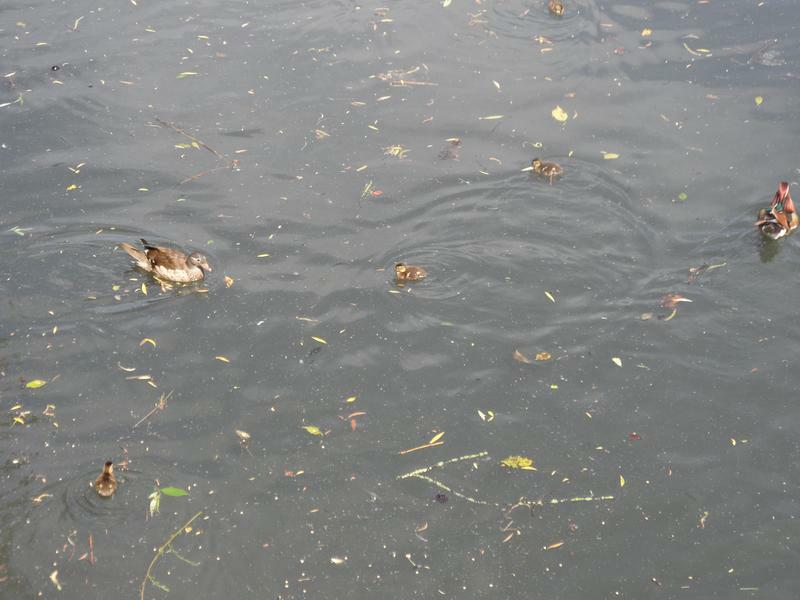 More hungry ducks swimming my way. 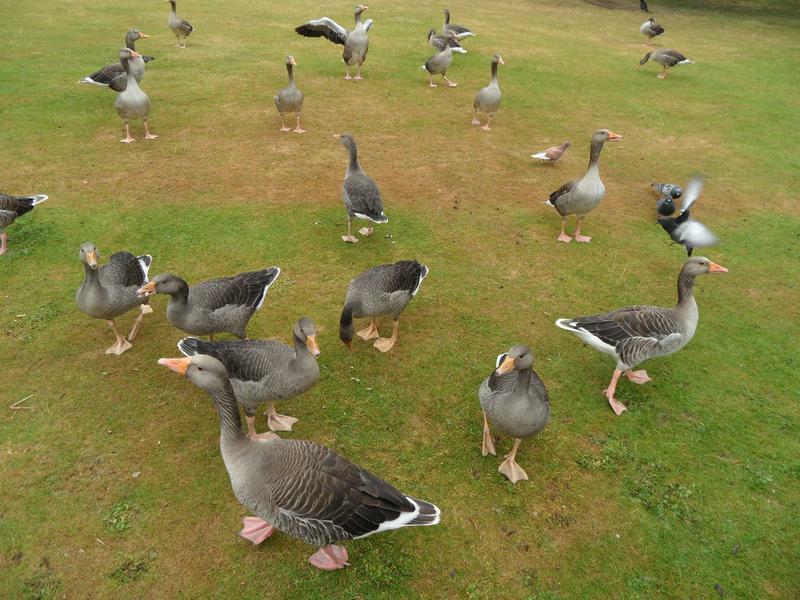 The Greylags seem indifferent today, only one is hungry. 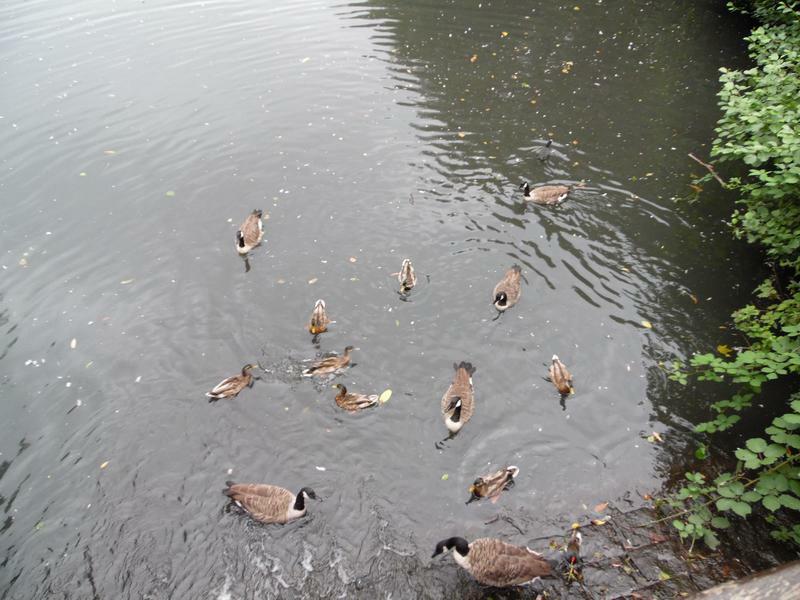 Probably a Mandarin duck family, but could be adults without their winter feathers. 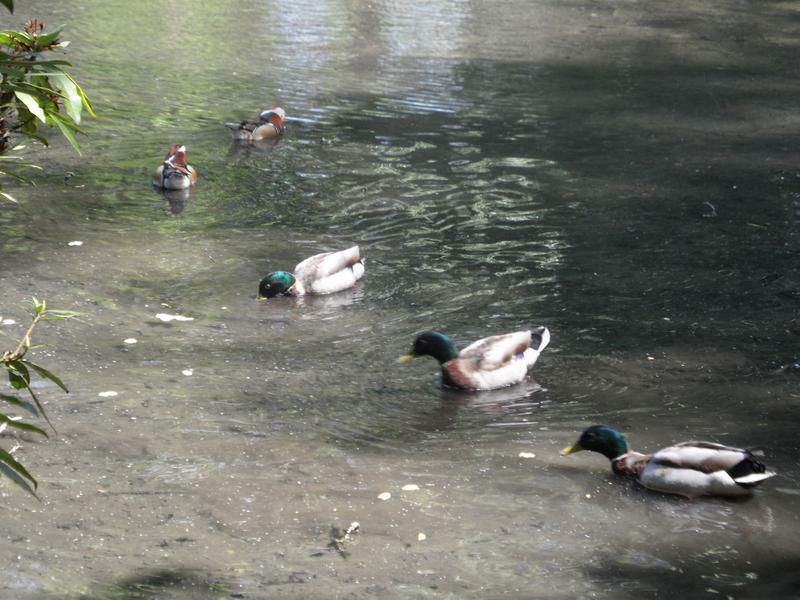 Several Mallards on the upper pond. 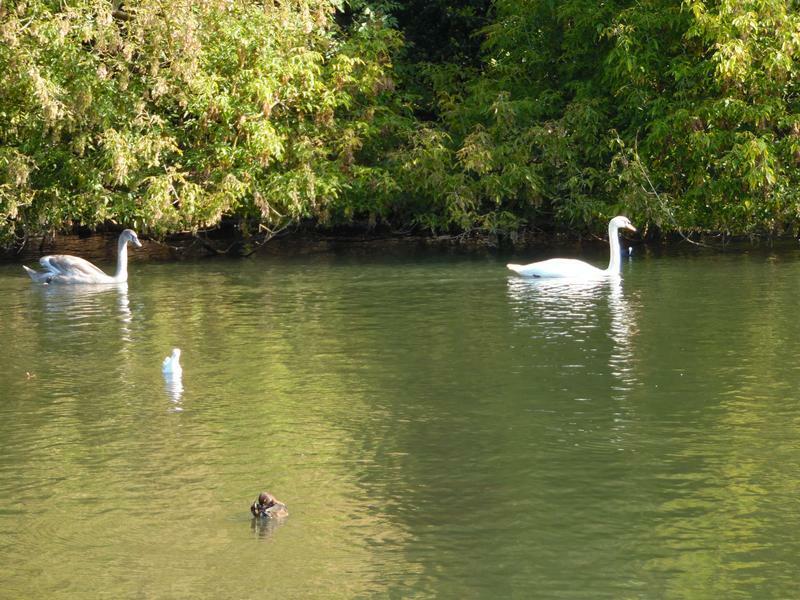 The swans are avoiding me again, I was on that side of the lake 10 minutes earlier. 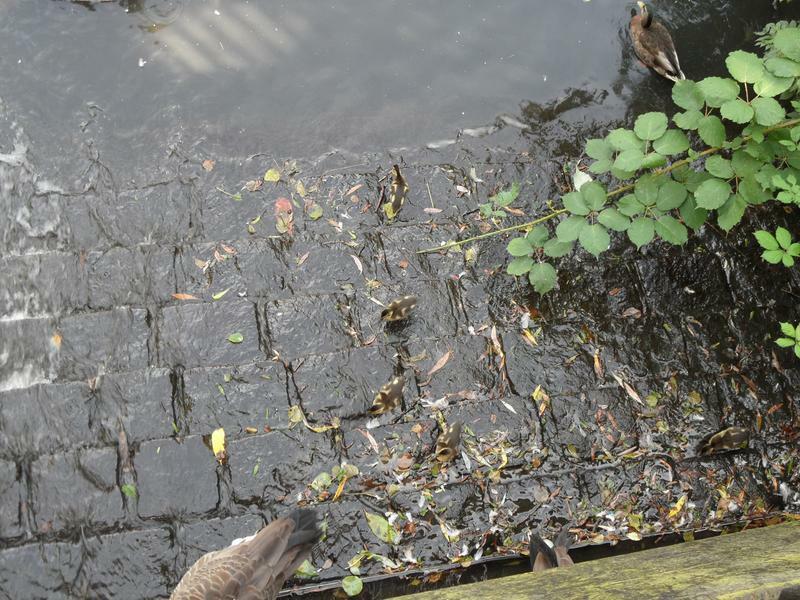 The new Mallard family near the bridge. 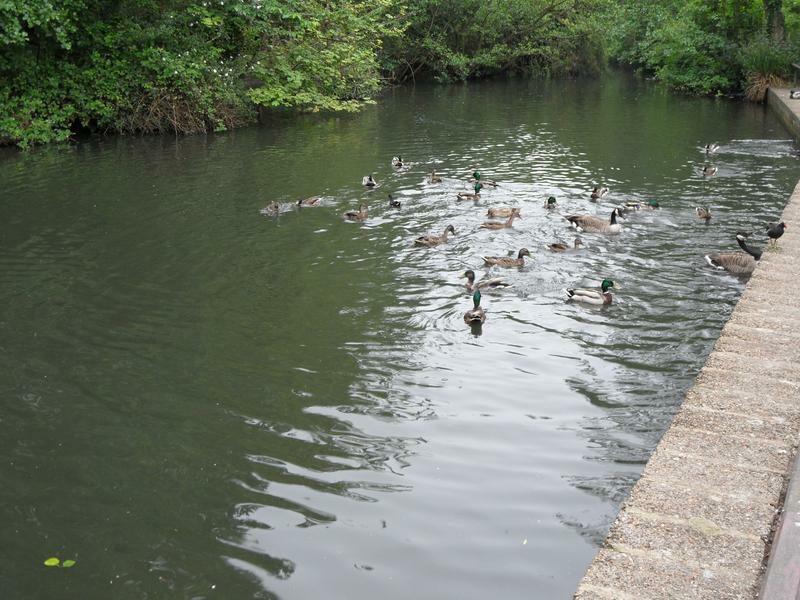 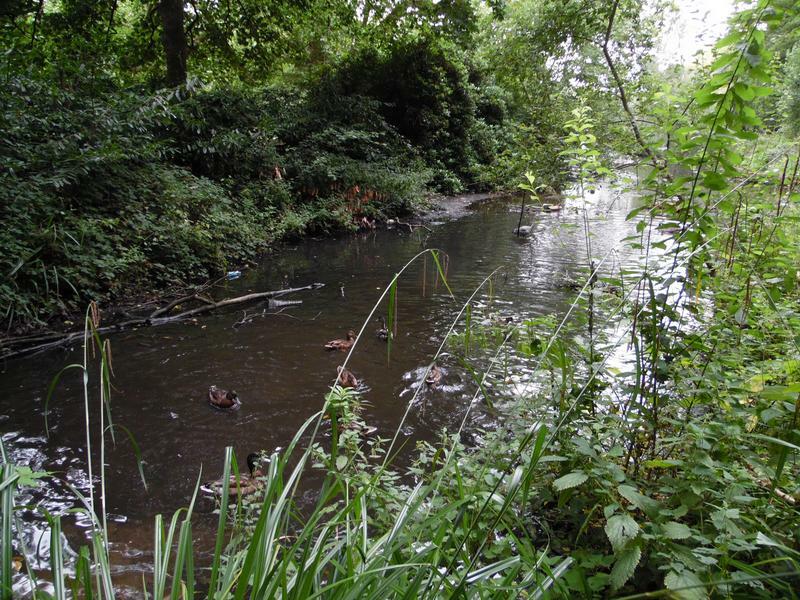 23rd August 2015, don't usually seem many birds along the stream entering the park. 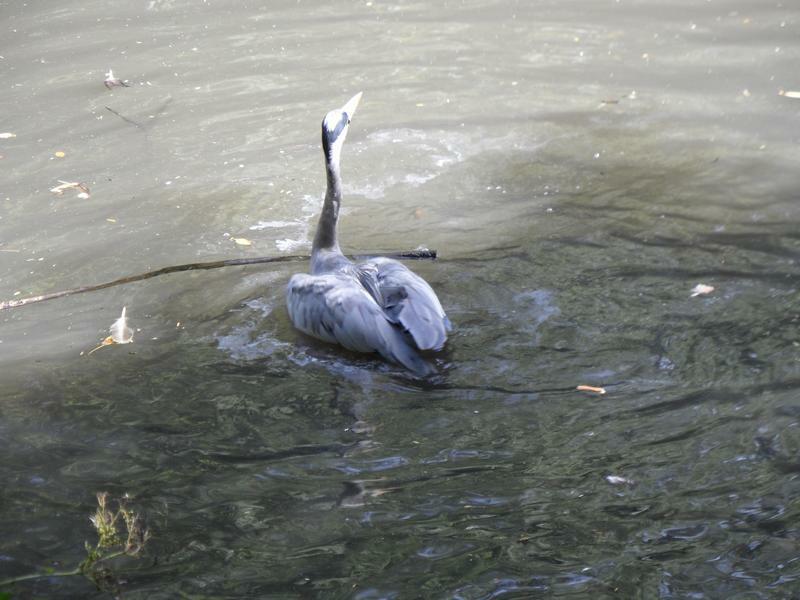 A hungry heron on the bottom pond. 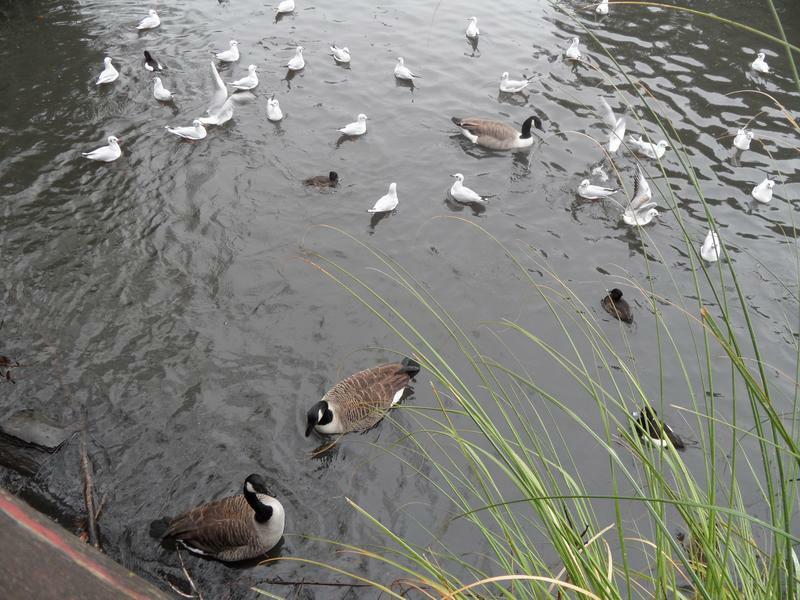 More birds on the bottom pond. 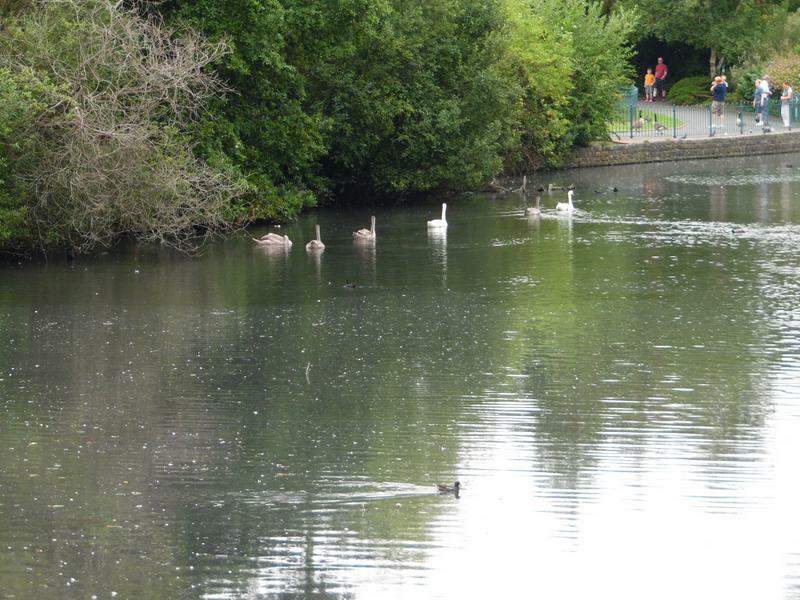 The swan family in the distance on the main lake. 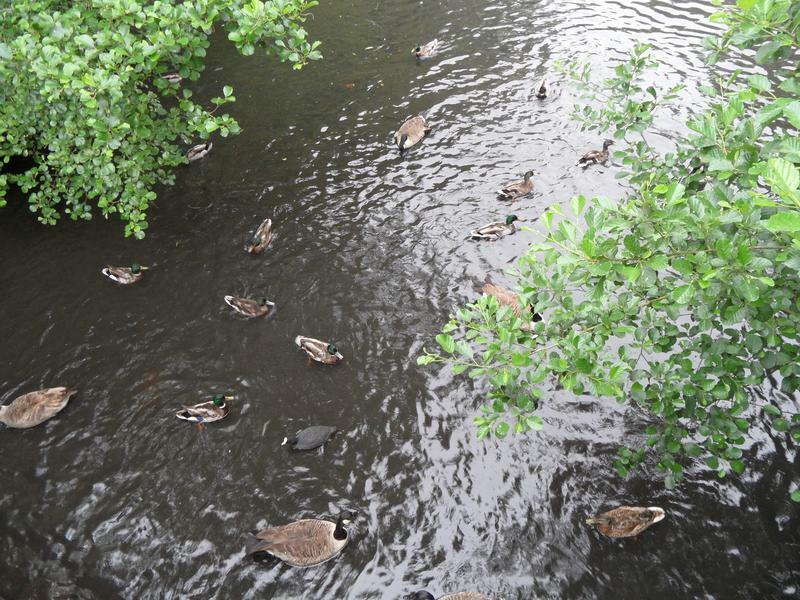 Several Mallards and geese under the bridge. 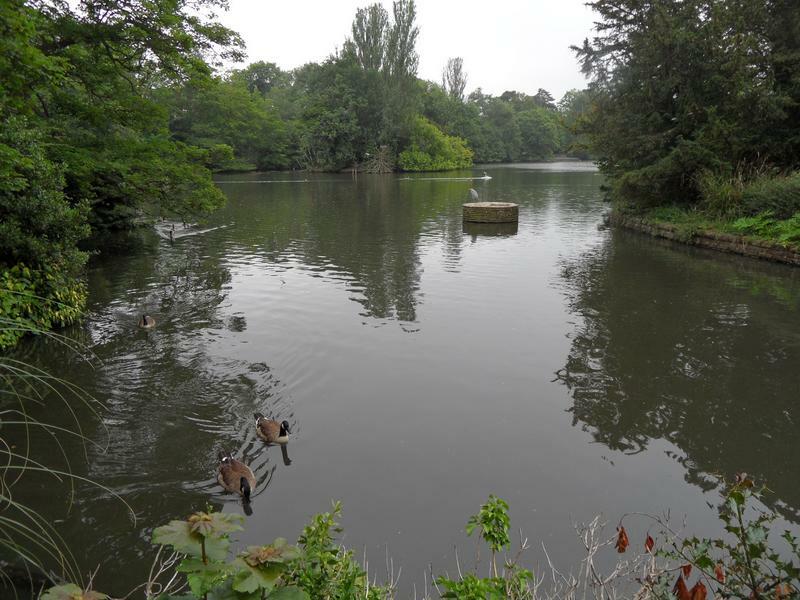 Looking back to the bottom pond. 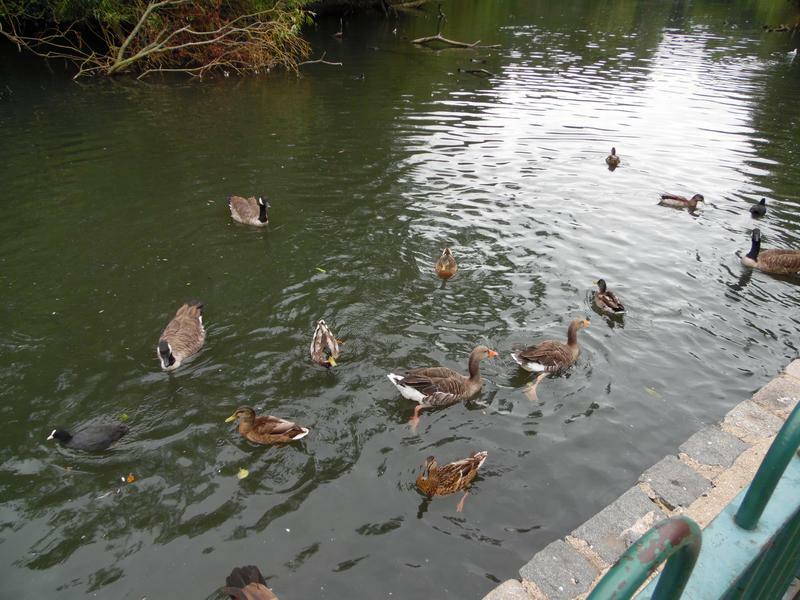 Hungry birds on the main lake. 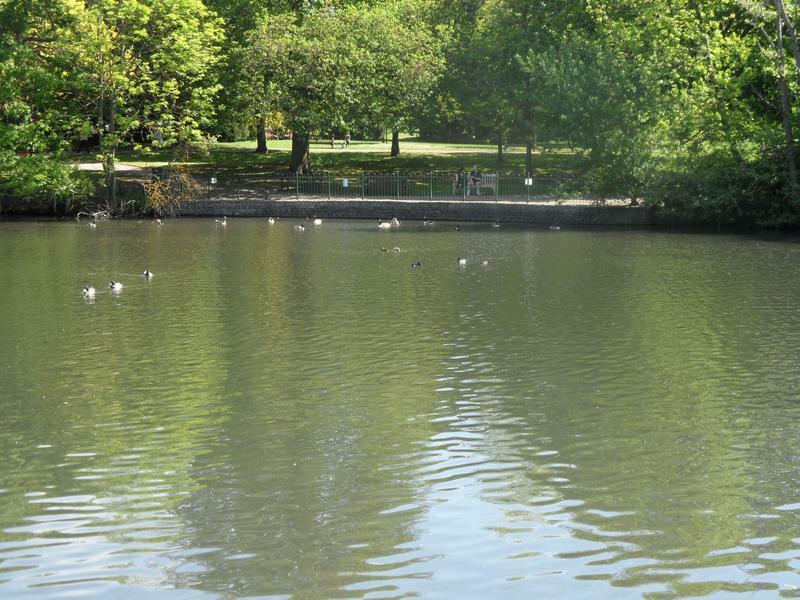 But the main lake itself is very quiet. 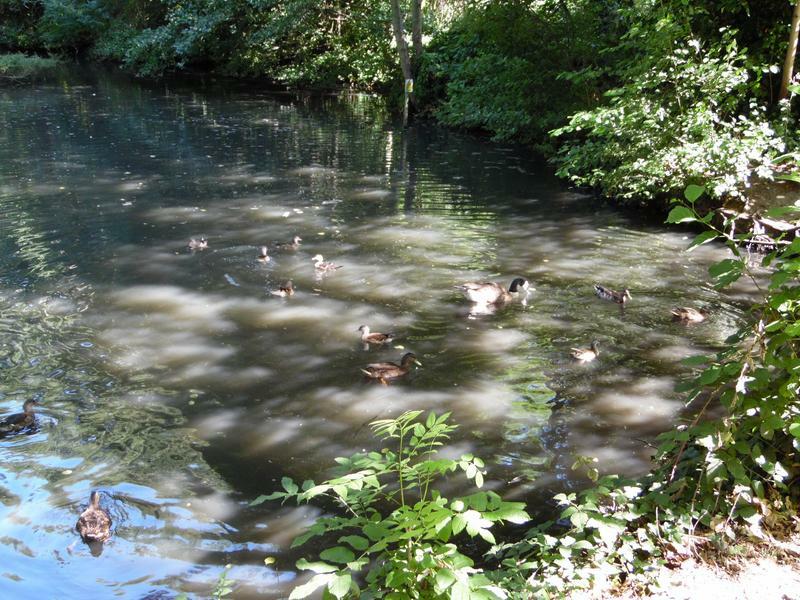 the stream under the waterfall will have the highest oxygenation. 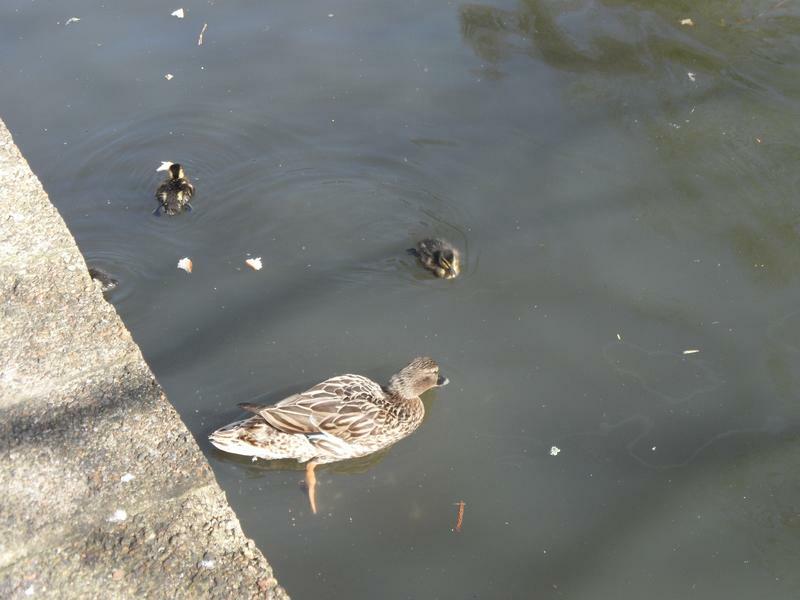 A Mandarin mother in the foreground, Mallards near the water. 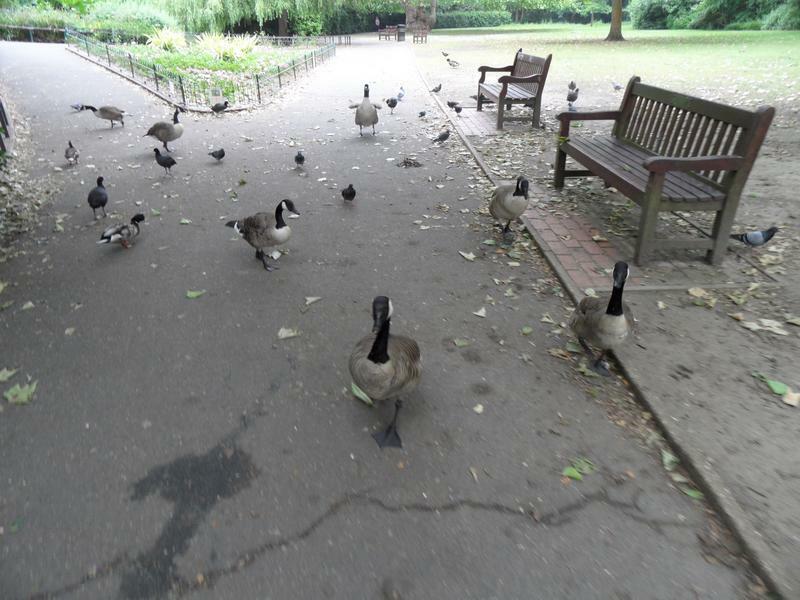 These birds don't seen very hungry. 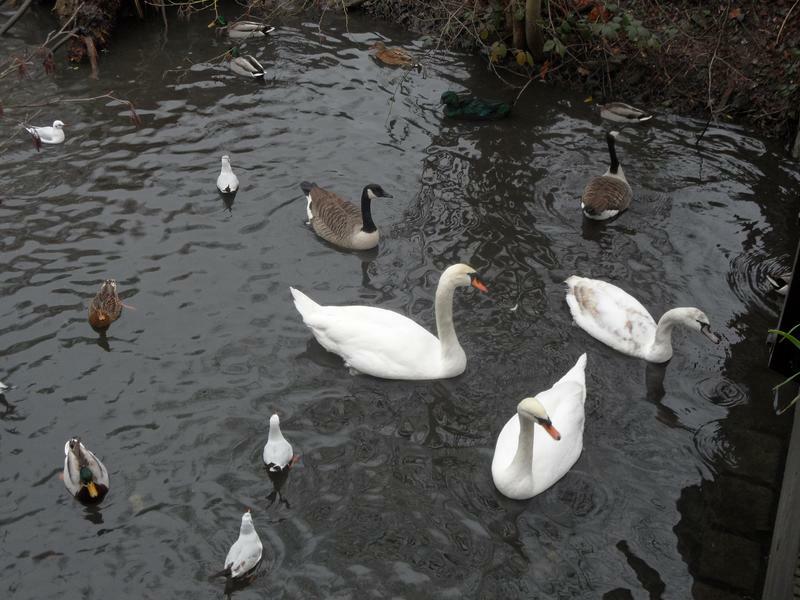 The swans are all in the middle on the lake, were sleeping with their heads down. 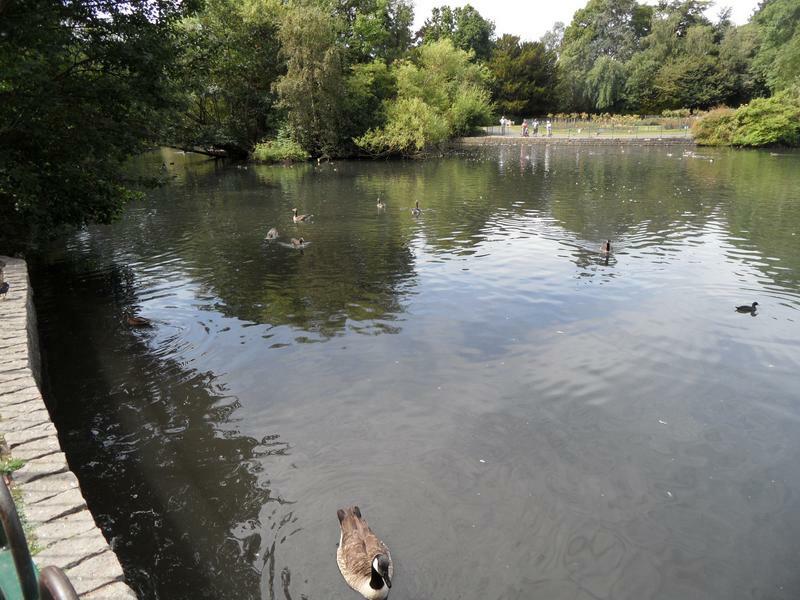 29th September 2015, the bottom lake is peaceful. 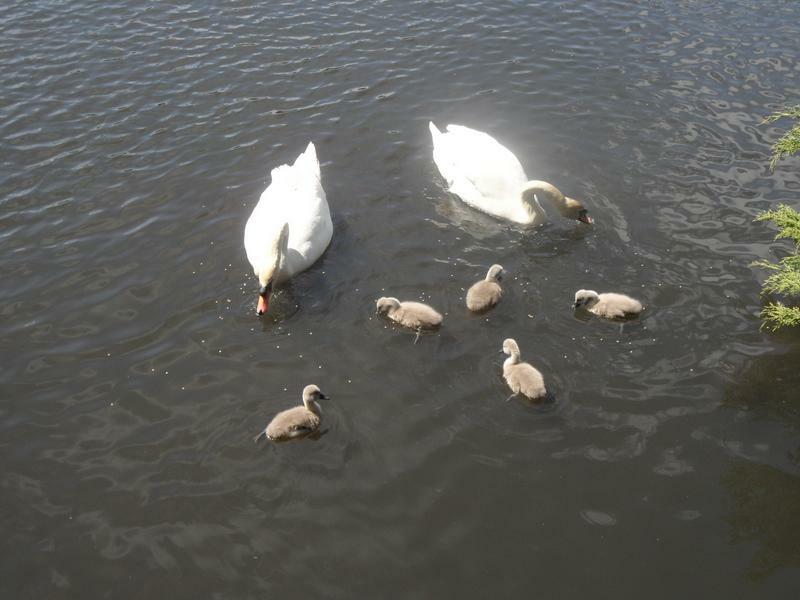 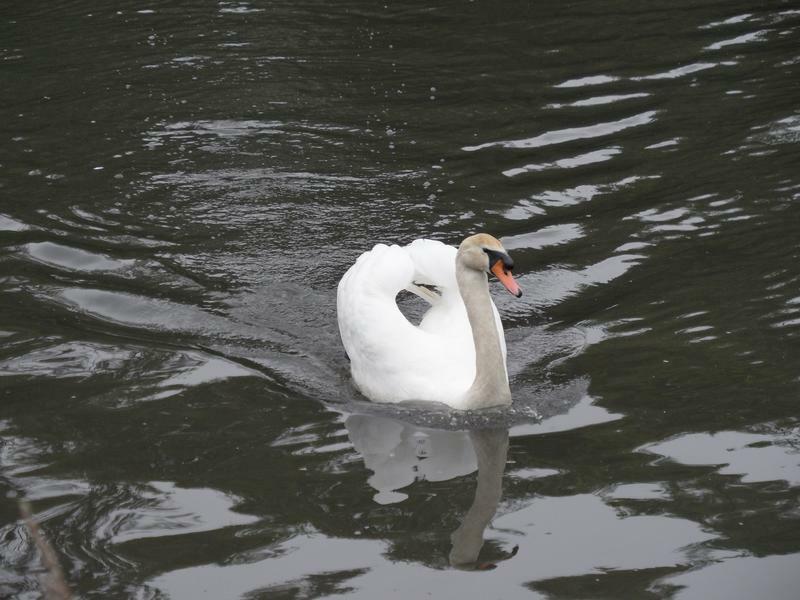 The swan family are initially spread out around the main lake. 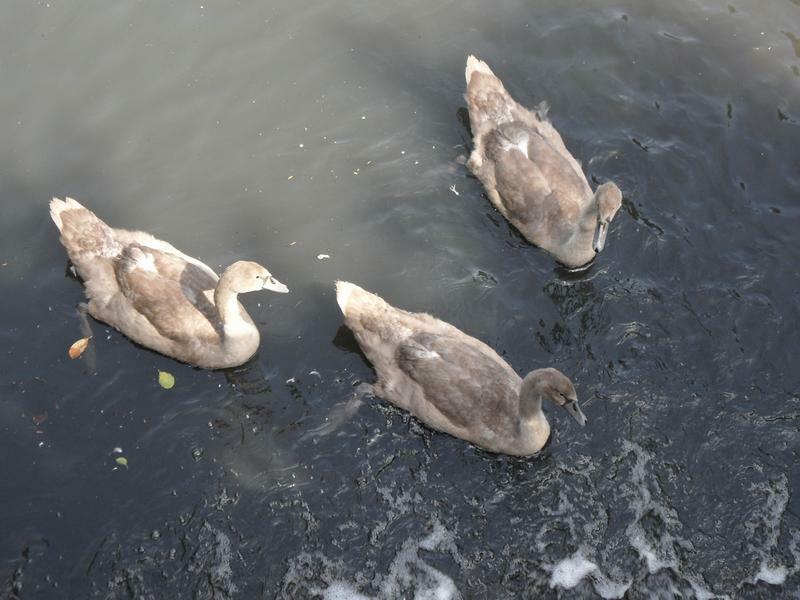 But finally the swans all get together, the cygnets are now fully grown, but still darker coloured. 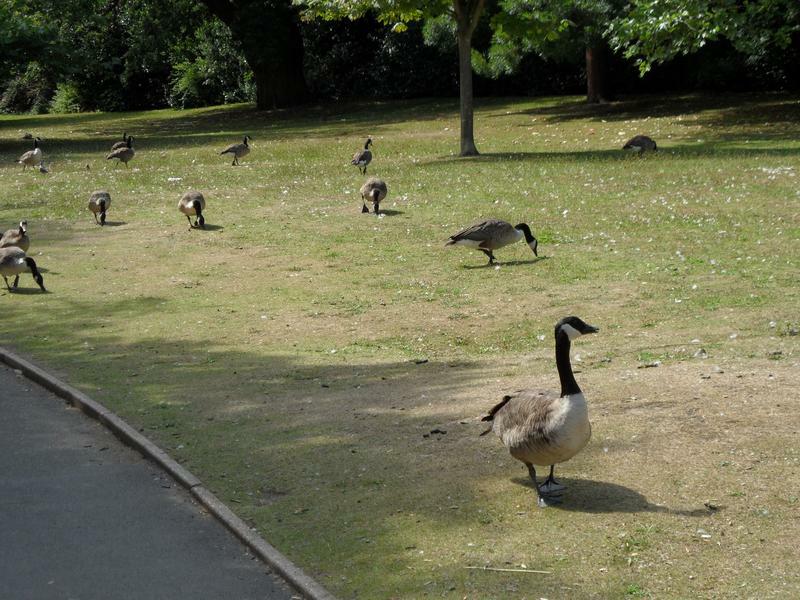 Lots of Canada Geese near the play ground. 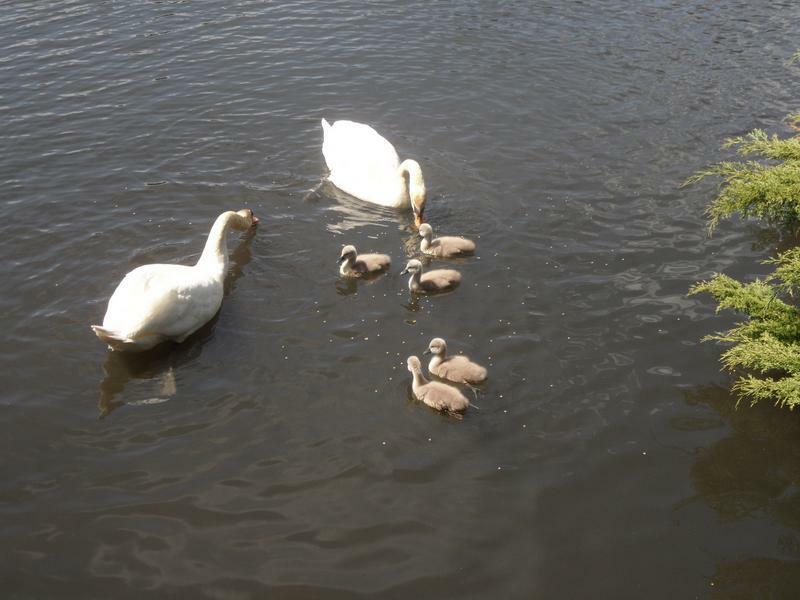 The swan family under the bottom bridge.